Not bad, right? 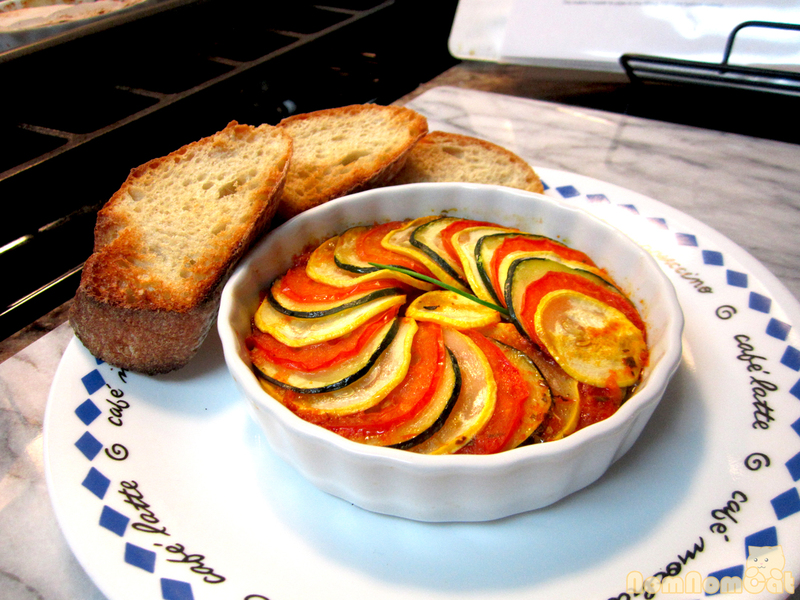 To be honest, this version of ratatouille is just a quick and easy way to enjoy the heartiness and comfort of the roasted vegetables in a delicious (and vegan!) dish that gets to the dinner table in as little as one hour. 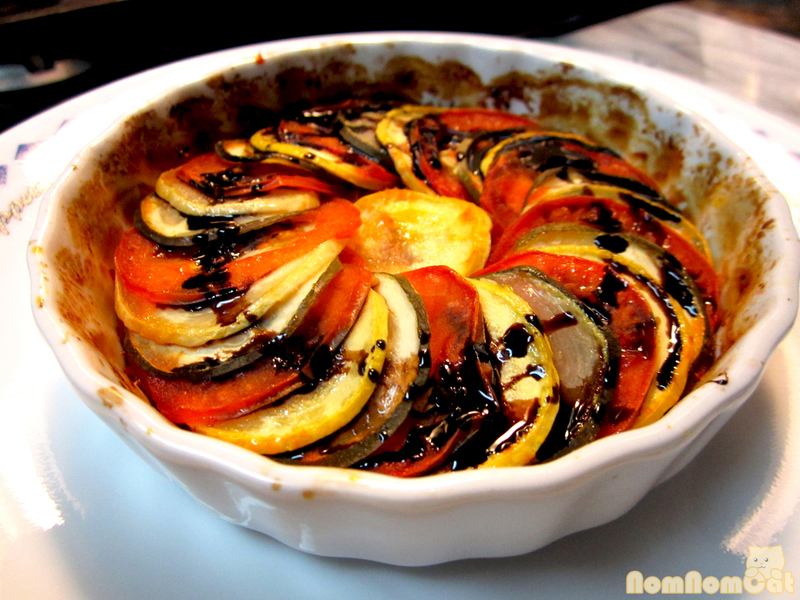 It mostly resembles Remy’s ratatouille in its styling with the use of thin slices as opposed to a chunky stew, but the sauce has been simplified and I omitted eggplants as a personal preference, (Remy, by the way, is the name of the rodent protagonist in the movie.) I learned recently that Remy’s version had been adapted from Thomas Keller, who was the culinary consultant during the production of the film. 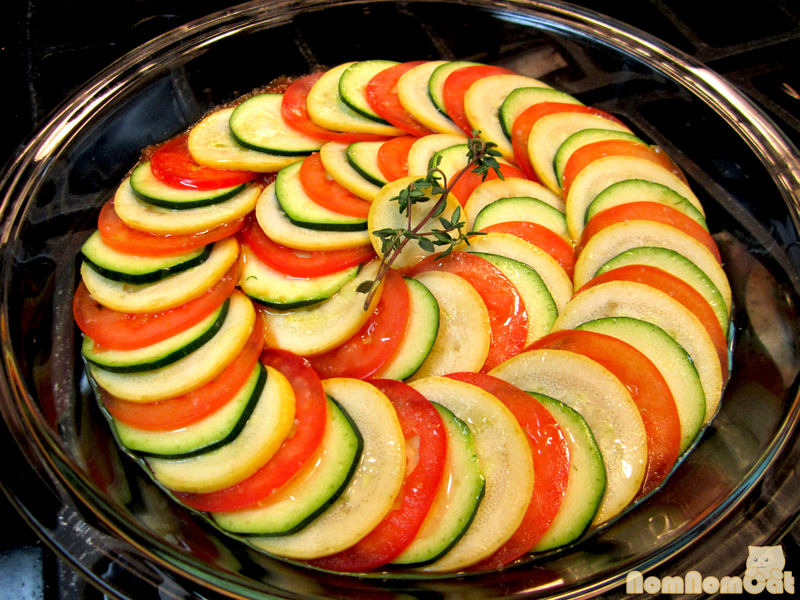 His confit byaldi recipe was posted in the New York Times in 2007, the same year the movie was released. So, for those of you doing the math, yes – I’ve been wanting to make this dish for the past 6 years and only recently became inspired and confident enough to give it a go. I am calling this Version I because while I do intend to tackle Thomas Keller’s recipe with its more traditional red bell pepper and tomato sauce base in the near future, this attempt was pretty darn tasty. Tasty enough, I feel, to be worth sharing. This recipe ended up yielding four 5″ diameter ramekins (I used low, fluted creme brulee dishes) plus enough leftover for one 8″ diameter pie dish… about 4-6 servings total. You could probably make two 8″ diameter pie dishes or one gratin dish if you were to make multiple layers (mine were all single-layered). We enjoyed this simply spread onto toasted baguette slices, though it would make an excellent side dish to a protein of your choosing. 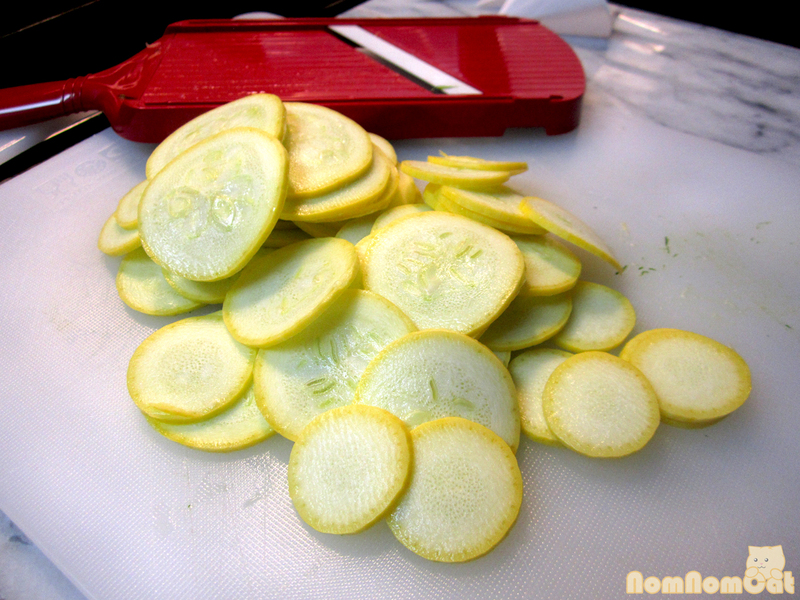 A mandoline is a must-have to easily get those uniform, thin slices. NomNomCat Tip #1: The sauce. 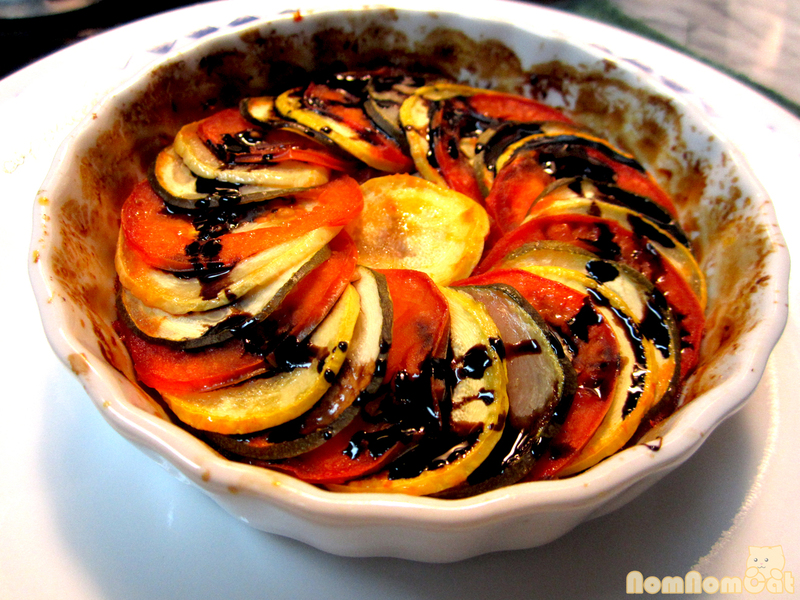 I used a homemade tomato sauce (roma tomatoes, garlic, onions, thyme, oregano – all simmered together until reduced) as the base, though ratatouille is more traditionally served with a roasted red pepper and tomato blend. 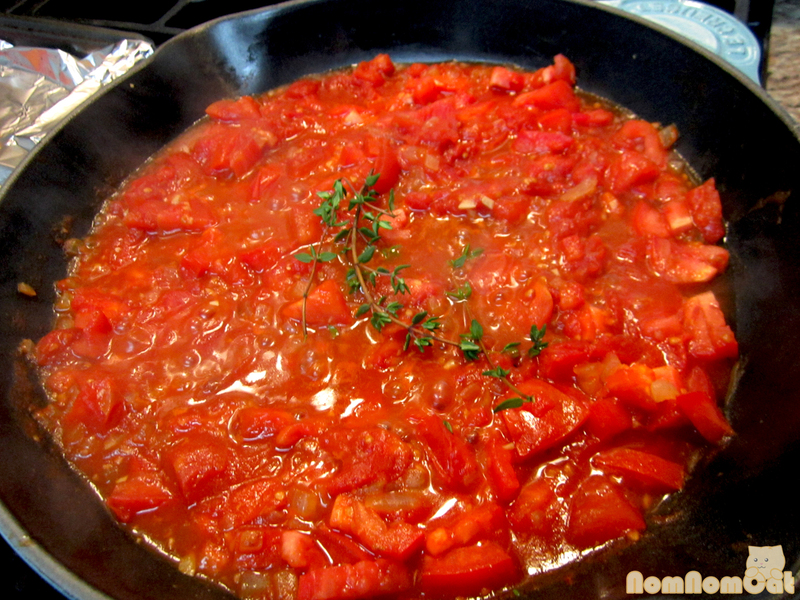 For our simplified version, you are welcome to use your favorite homemade (or even store-bought if you must) tomato sauce. NomNomCat Tip #2: The vegetables. 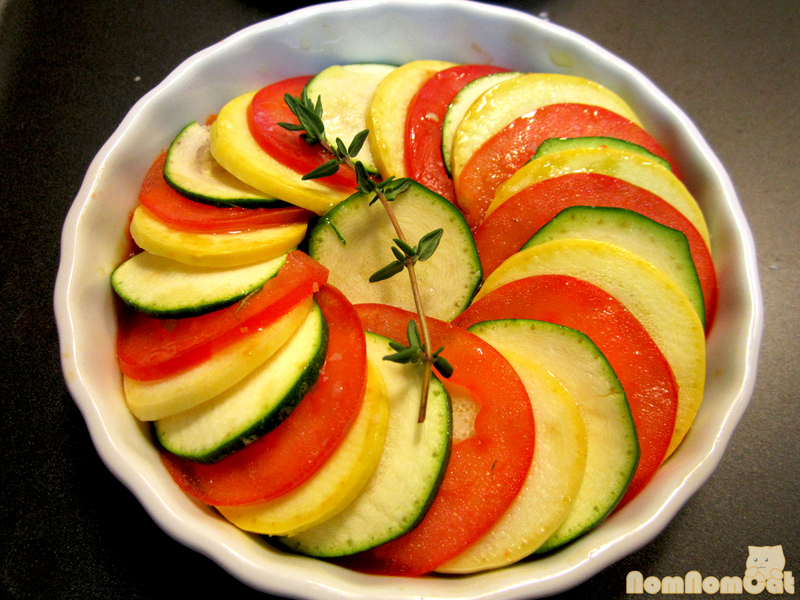 There are so many versions of ratatouille but many feature a combination of zucchini, yellow squash, tomato, eggplant (aubergine), and/or bell peppers. 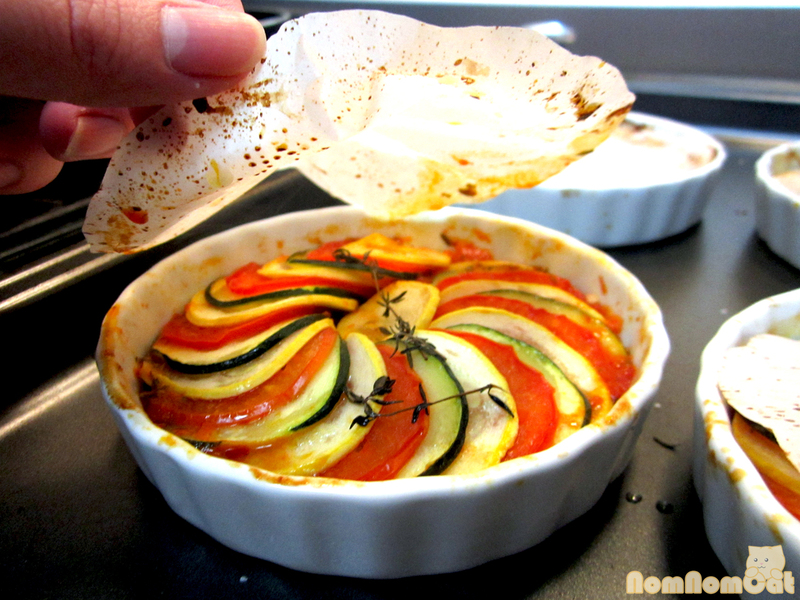 What makes this particular ratatouille special is its presentation. 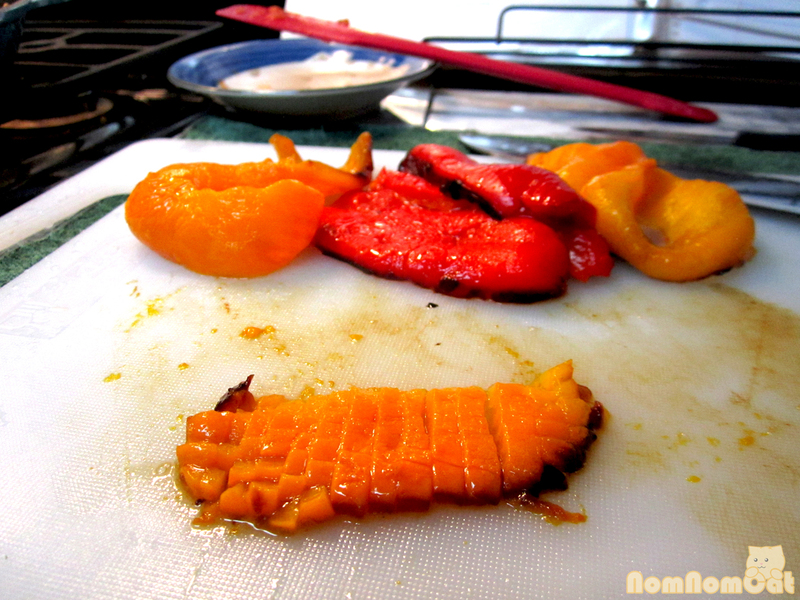 The thin slices, easily accomplished with a mandoline, roast up quickly and look impressively colorful. When purchasing your produce, you’ll want to keep in mind that vegetables of similar diameters will yield the best circles for layering. Also, beware that squashes hold a lot of water which release during the baking process. 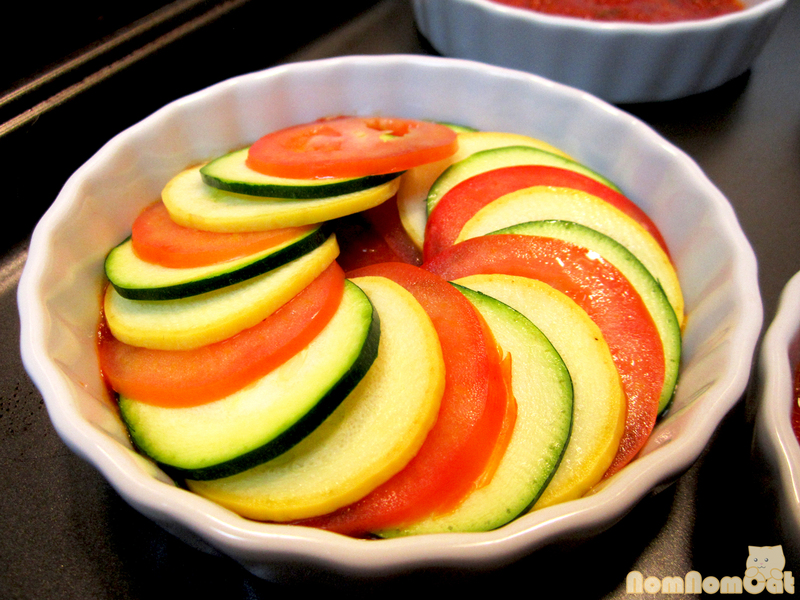 To avoid soggy ratatouille (especially if you are using eggplants), sprinkle the slices with a bit of salt to draw out some of its water before layering; . 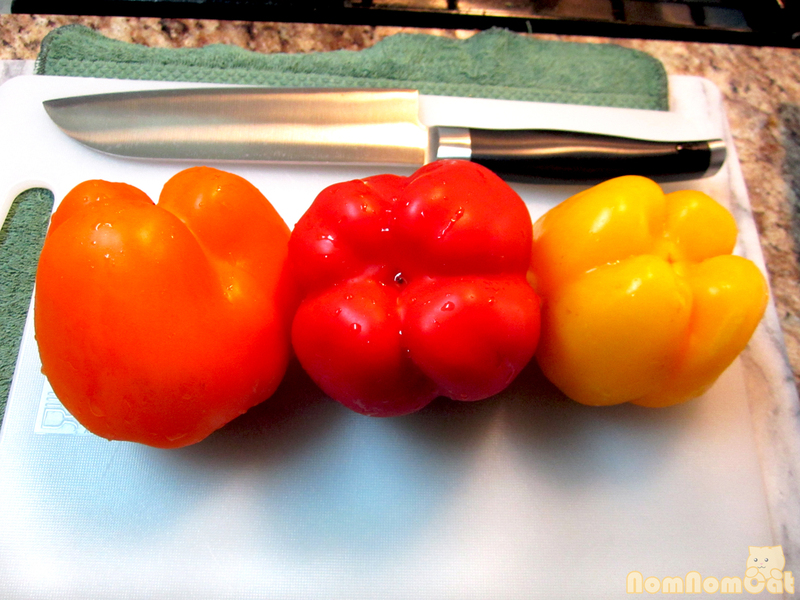 Lastly, depending on the size of your vegetables, the quantity may vary. 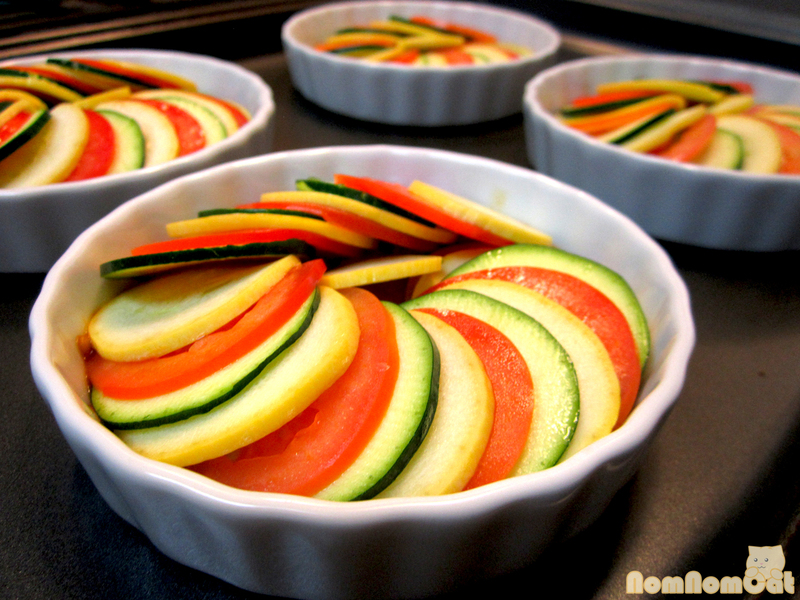 You just want to end up with an approximately even number of slices of each vegetable (if you’re OCD like I am) or you can always adjust your layering patterns to accommodate any shortages. Have fun with it! First, preheat the oven to 375 degrees. 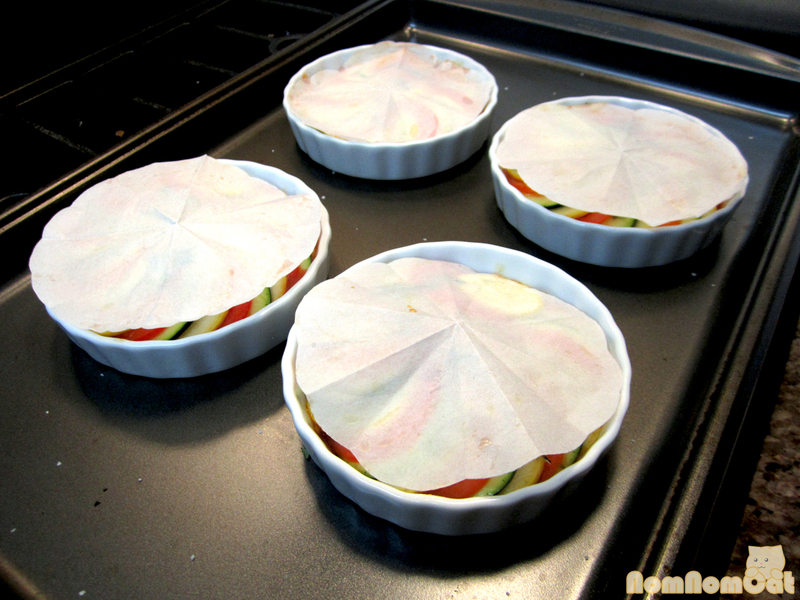 Then prepare your parchment paper circles. You’ll need to top each dish with these later and it’s much easier to measure when the vessels are empty than when they are stacked full of vegetable slices. 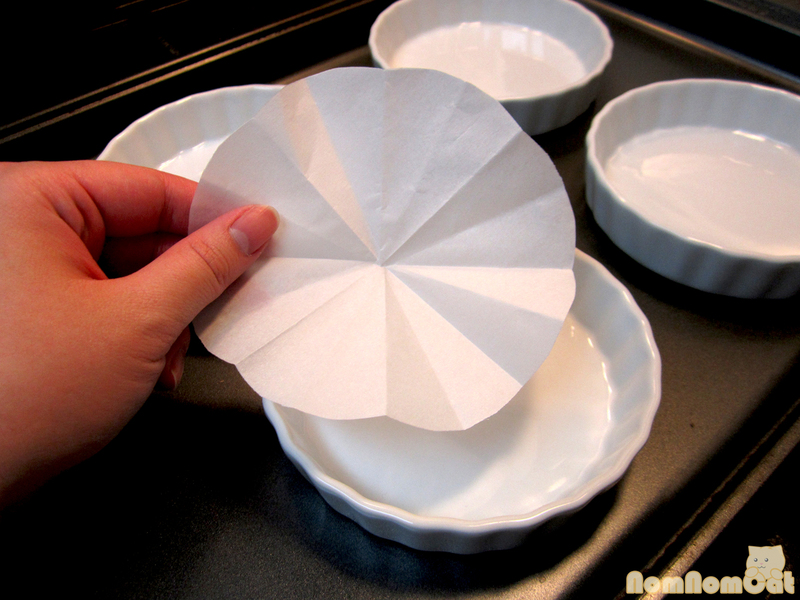 To make a quick circle, tear off a square sheet of parchment. Fold it in half twice so that you get a smaller square. Fold the side with 2 “flaps” onto the side with the single thick crease, making a triangle. Flip over and fold one more time, so that the side with 3 flaps matches up with the (new) single thick crease. Line up the point approximately in the center of the dish and eyeball the length of the radius. Using scissors, snip across in a slightly curved line. Unfold and voila – a perfect (ish) circle! Next, prepare your vegetables. I used my Kyocera ceramic blade mandoline on its thickest setting (3.0 mm) so I had all of my vegetables sliced in a matter of minutes. 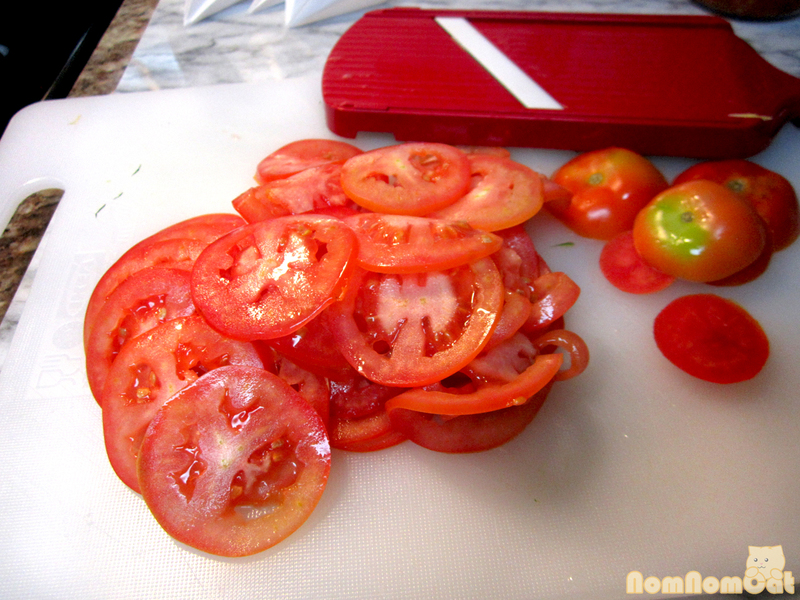 If slicing by hand, just be careful – the slices should not be paper thin or they’ll fall apart in the cooking process. A few millimeters thick and most importantly, consistent thickness for even baking. Set your slices aside. I let the two squashes share a dish while the tomatoes sat in a separate bowl since they had already started releasing their juices. 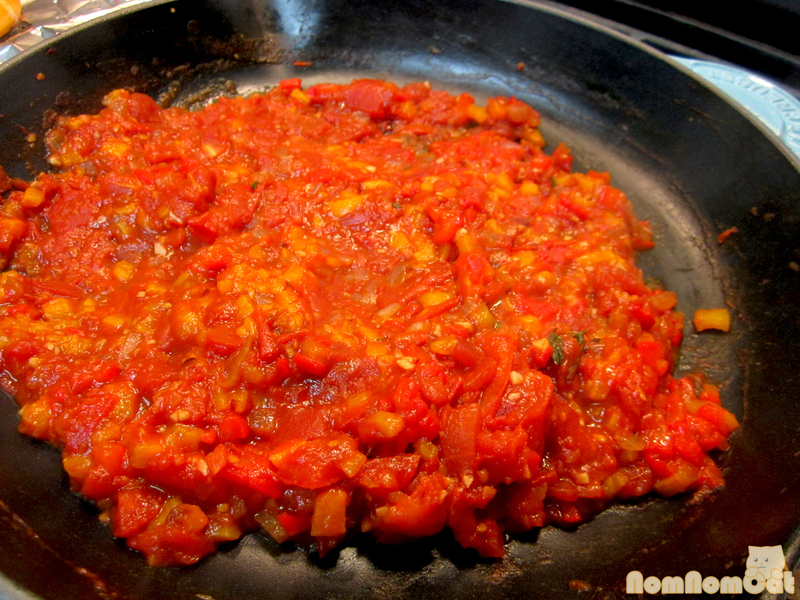 I used our tomato sauce straight out of the refrigerator since we will be baking it anyway. Spread a thin layer at the bottom of each baking dish. 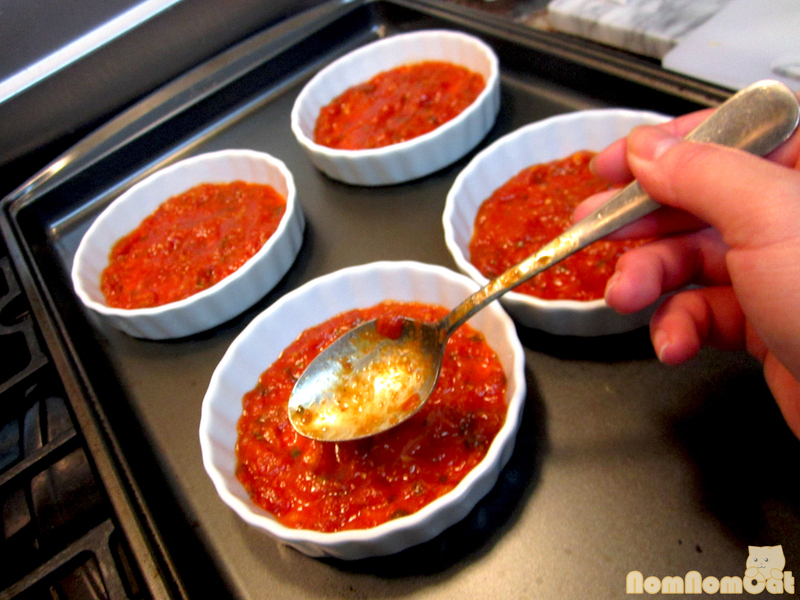 These ramekins held about 2-3 spoonfuls of sauce apiece and I used the remainder to line my 8″ pie dish. Start layering! Have fun with this step. 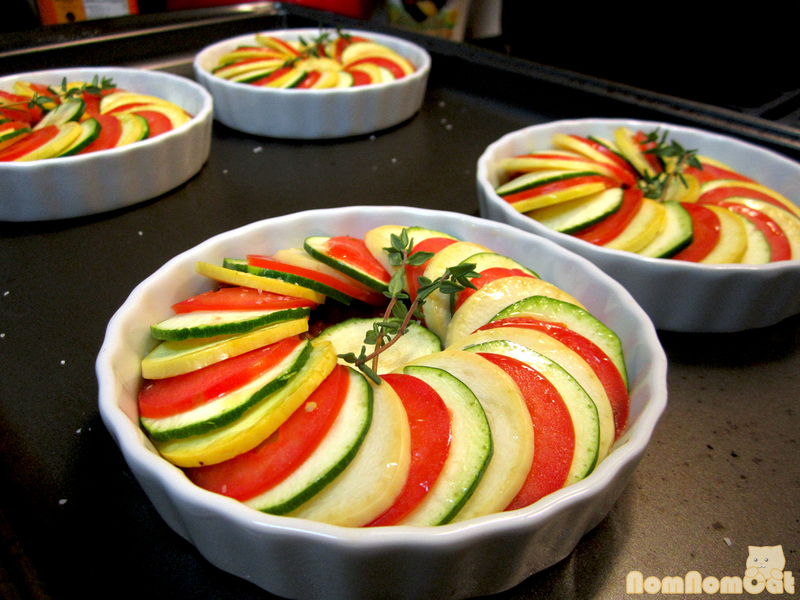 Mine are all in the same pattern (yellow squash, zucchini, tomato, yellow squash, zucchini, tomato) to streamline the process and to satisfy my inner OCD. You are welcome to mix it up or arrange them randomly. Just be sure to overlap the slices, leaving just enough of the underlying layer visible for its color. 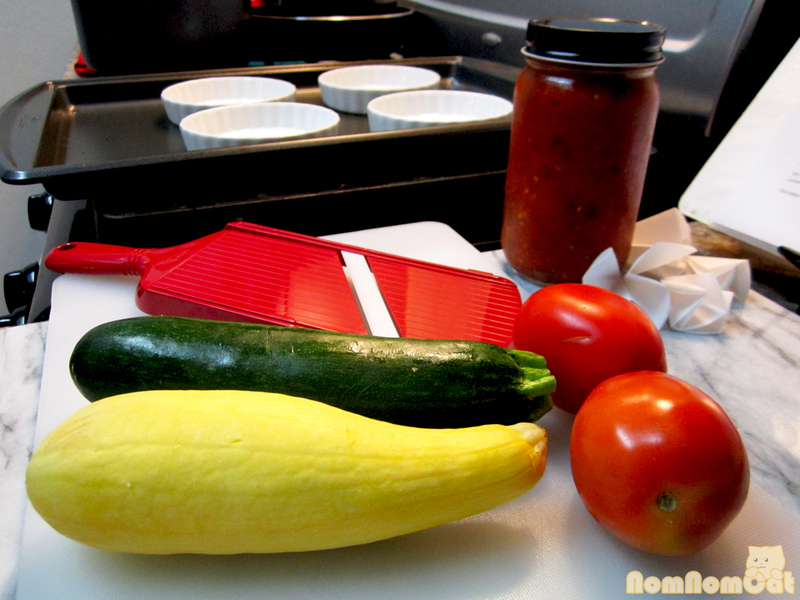 Brush the top with a bit of olive oil to help keep the exposed squash from drying out. I drizzled a thin line of oil over the top and rubbed it on with a clean finger. Whatever works. 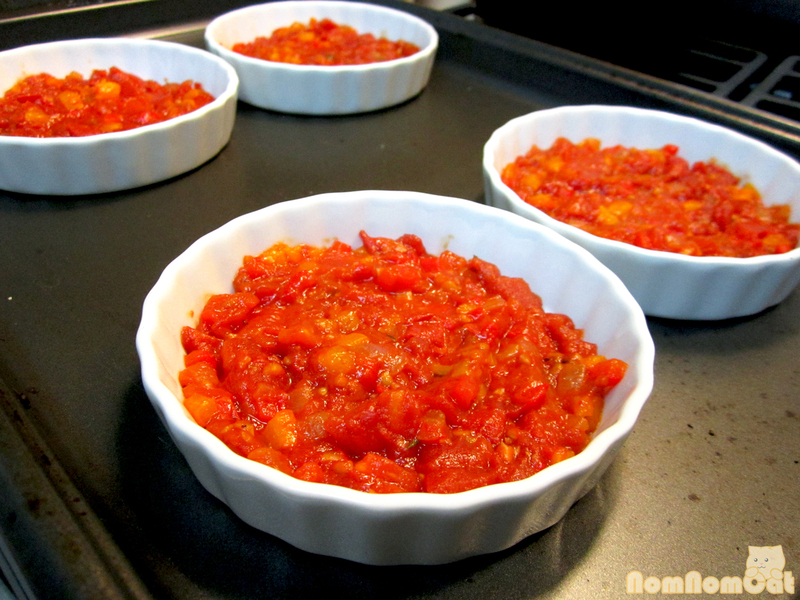 The larger dish – almost ready for the oven! Top with your pretty parchment circles and press down gently. 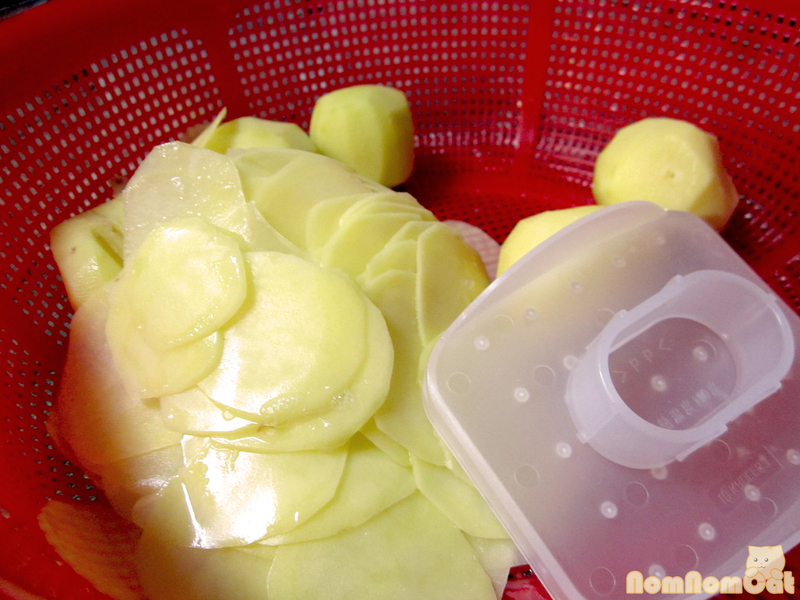 The light brushing of oil will help the paper “stick” and stay close to the vegetables. Bake in the 375 degree oven for approximately 40 minutes. When you are a few minutes away from the timer going off, start toasting crostini-sized slices of baguette (about 1/2-inch thick, sliced on a bias). Remove the parchment and the (probably burnt) sprig of thyme before serving. To make things extra pretty, I borrowed Remy’s plating idea to use a single chive tip to garnish. Although now I have a lot of leftover chives in my refrigerator… time to research another recipe! We each ate two of those ramekins with toast for dinner and split the contents of the pie dish for the next day’s lunch. 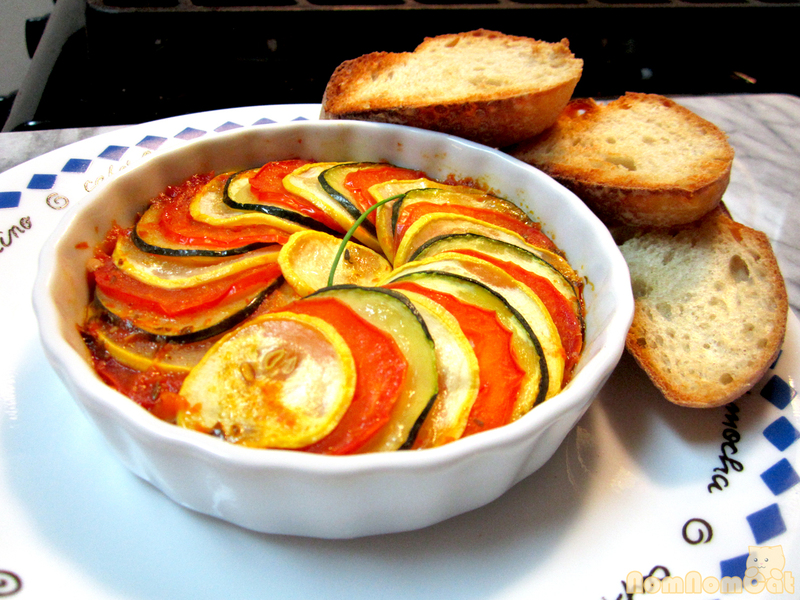 If you plan to serve this as a side dish, I think one ramekin per person would be sufficient. One of my friends likes to drizzle the ratatouille with balsamic vinegar before baking (or balsamic reduction after baking would also work), top it with gobs of goat cheese and serve it over pan fried polenta. Fancy! Dress it up or dress it down, there’s no right or wrong way to enjoy this comforting dish especially on a cool autumn night. Bon appetit! This post is part of the monthly link up party Our Growing Edge. This event aims to connect food bloggers all over the world and inspire us to try new things. 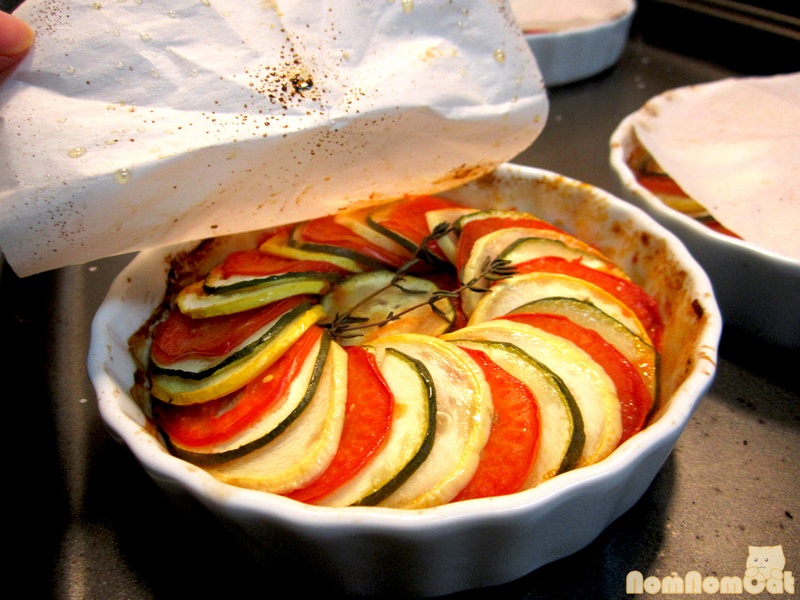 The ratatouille from Ratatouille has been on my bucket list for literally years and I cannot believe how easy it turned out to be! My only regret is not working up the courage to try making this sooner, but as they say, better late than never! We are hosting this month’s link party and we can’t wait to see the autumn dishes from our friends in the northern hemisphere AND the spring dishes from our friends in the southern hemisphere! Want to join our link party? Check out this post for details. ALL bloggers are welcome. Of all the dishes and items that I’ve been wanting to make at home rather than purchase from a store (pasta and croissants, for example), crackers just never seemed to cross my mind. 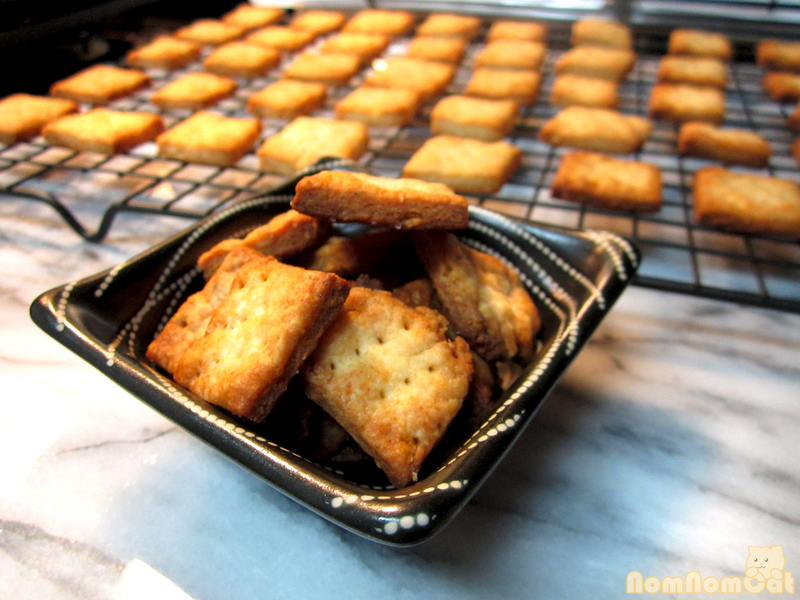 Not that I reach for those bright red boxes of Cheez-Its very often anyway, but once I saw these homemade crackers on Dinner of Herbs, I decided that I would give it a go. Plus, they would be the perfect addition to the picnic I was packing for a girls’ night out at the Hollywood Bowl. As it turned out, they were easy to make while seeming deceptively impressive to friends and guests. Step 1: Preheat the oven to 400 degrees F. In a food processor, pulse together the flour, parmesan, butter, salt, and thyme. 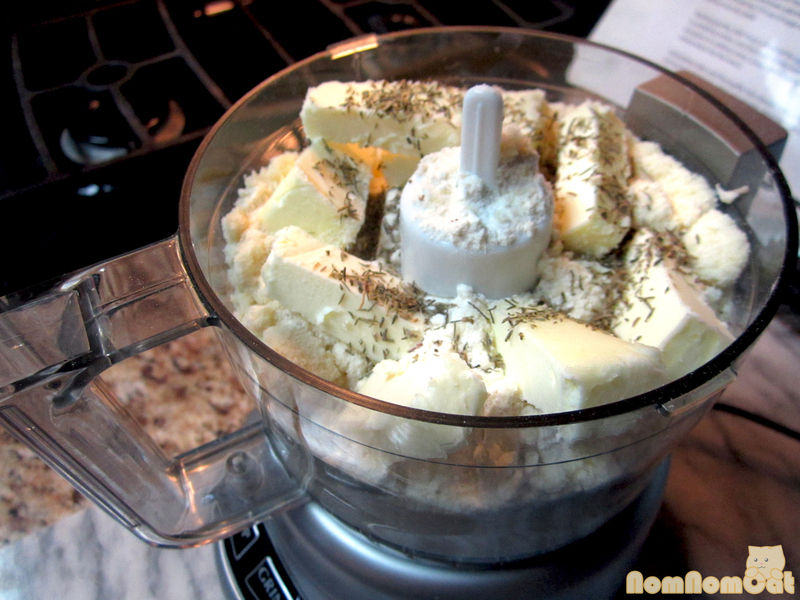 Continue pulsing until the butter has been broken down and the mixture resembles finely crushed breadcrumbs. Step 2: Cover your work area with a large sheet of parchment paper. 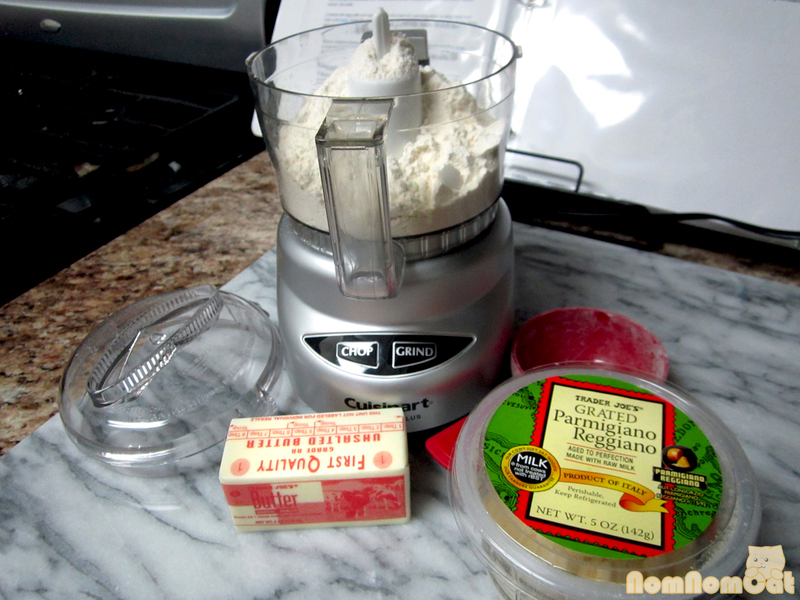 Turn out the contents of the food processor and make a well in the center. Add the cream. Step 3: Knead gently to distribute the cream. There should be just enough moisture that it comes together like a dough. 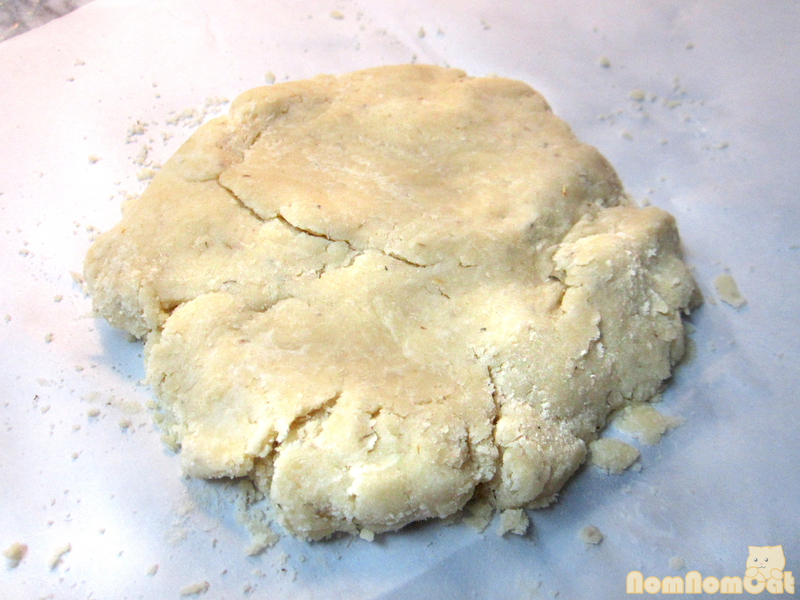 If it is still crumbly, add more cream or water, 1 tablespoon at a time. 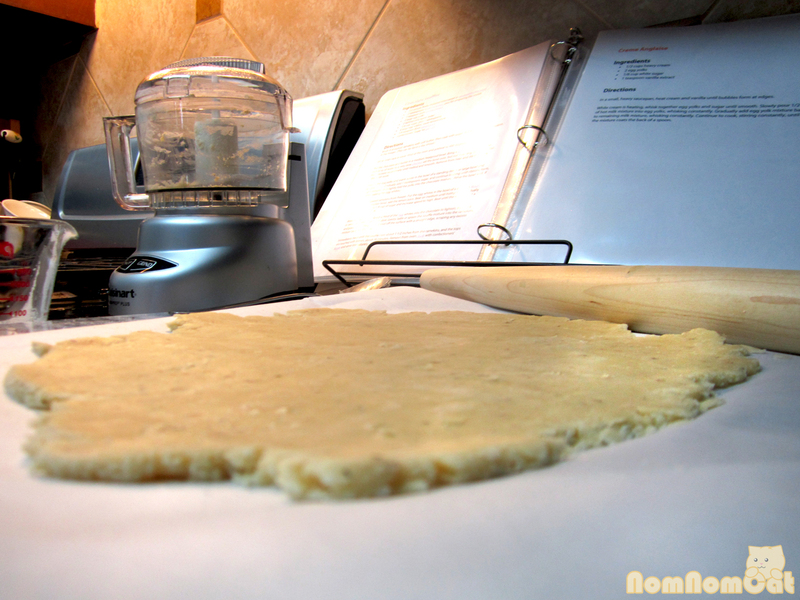 Step 4: Roll the dough into a thin sheet, no thicker than 1/4 inch. If the dough starts to stick to the rolling pin, lightly dust with flour. 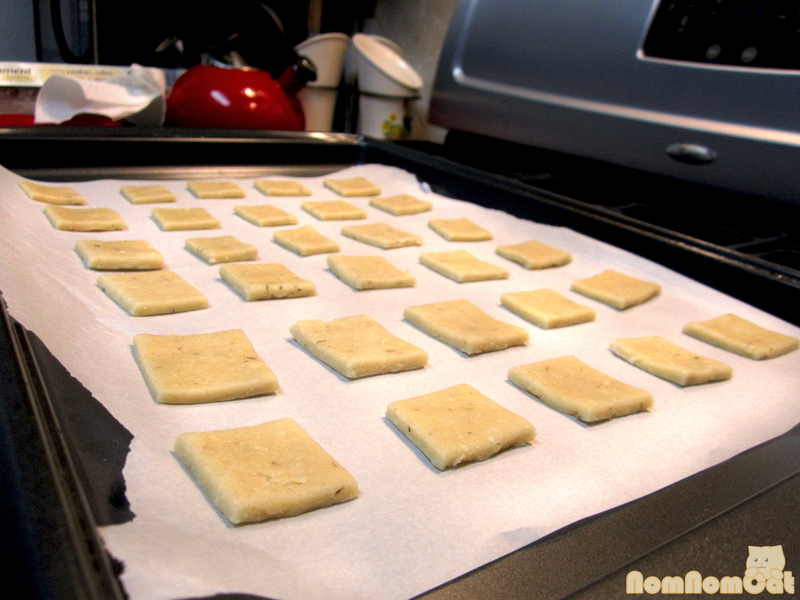 Step 5: Using a pizza cutter or pastry wheel, cut the rolled-out dough into square pieces, approximately 1 to 1.5-inches. 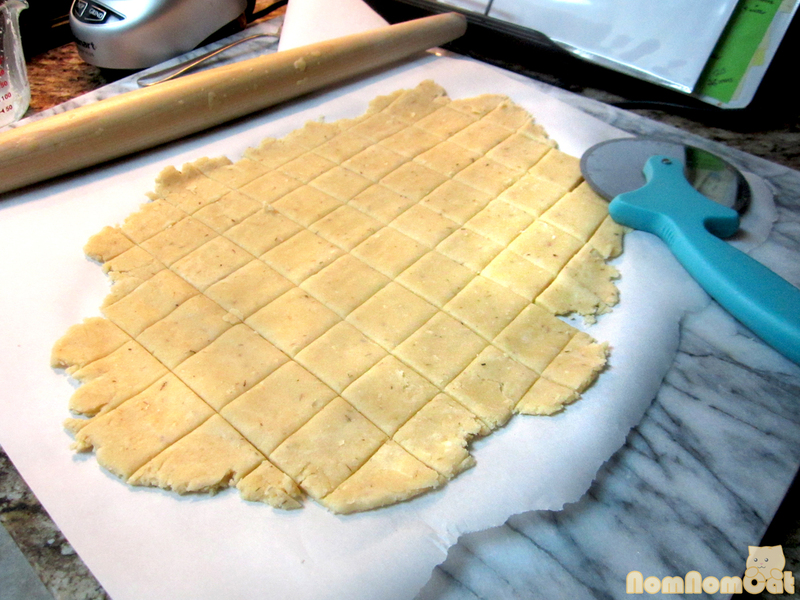 Don’t worry about the rough edges – you can either ball up the scraps, re-roll, and re-cut, or just bake them as is. 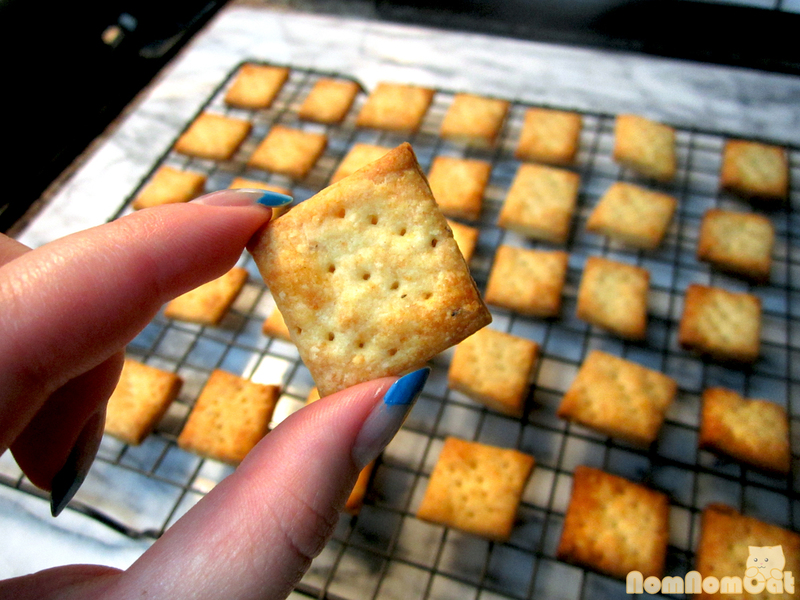 Imperfect crackers are still delicious crackers. 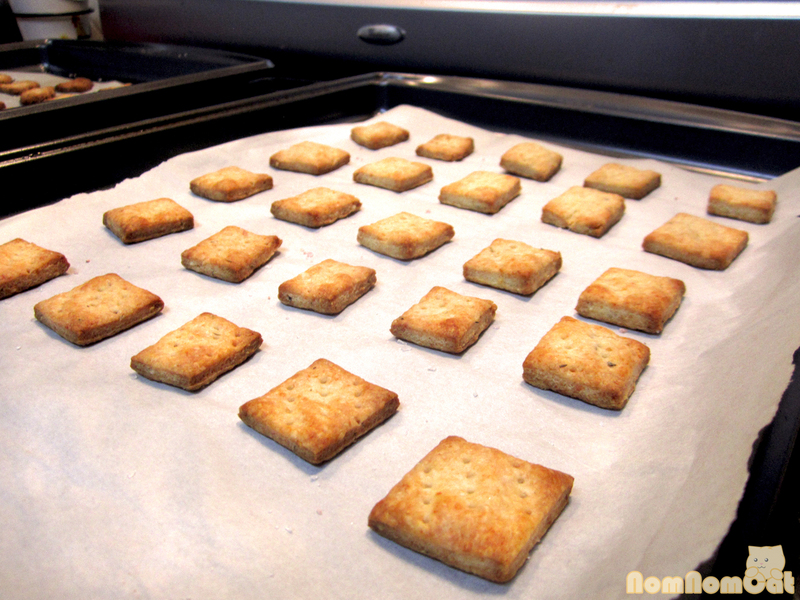 Step 6: Arrange the crackers about an inch apart on a baking sheet lined with parchment paper. 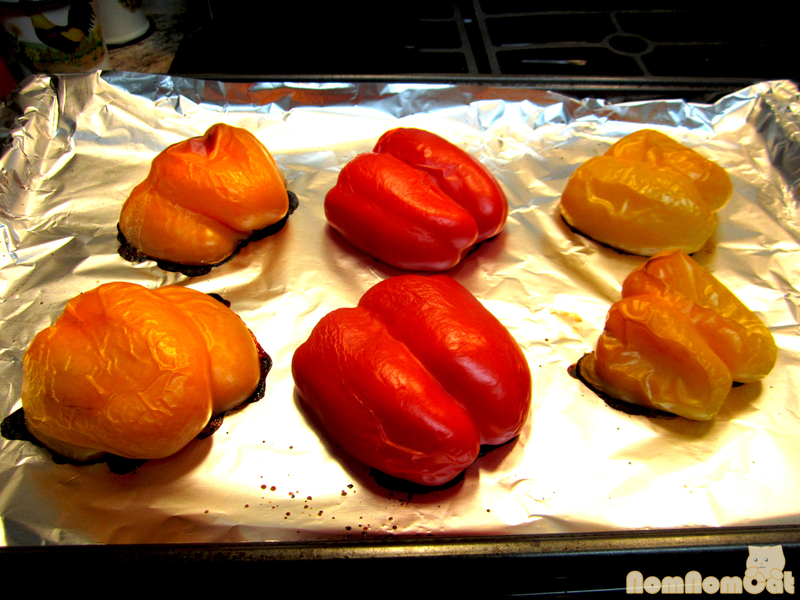 They will rise and puff up a bit while baking. Step 7: Using the tines of a fork, gently dock each cracker a few times to prevent them from puffing up into pillows. Step 8: Sprinkle with a bit of salt (I used Himalayan pink salt). Bake in the 400 degree oven for about 12 minutes. I rotated the pans halfway through (swapping the trays that were on the top and bottom racks and turning them 180 degrees before returning to the oven) to promote even baking. 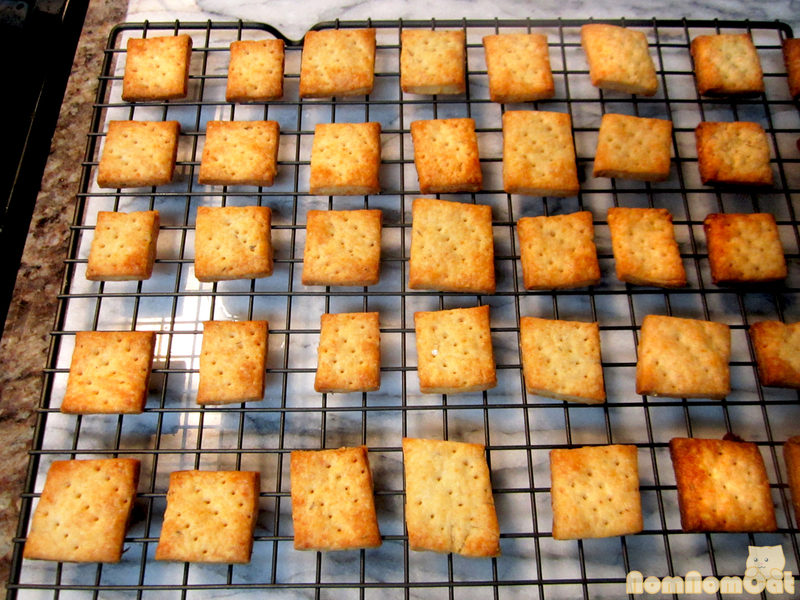 Step 9: Let the baked crackers cool on a wire rack. You can serve them warm, but if you plan to store them for later, wait until they are completely cooled and transfer them to an airtight container. Step 10: Bon appetit! 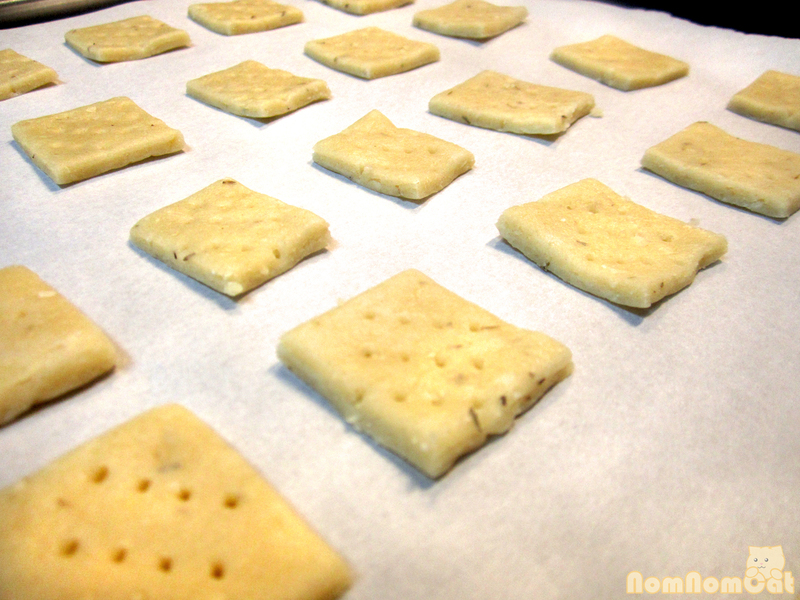 These homemade crackers are more dense and crumbly than the store-bought kind, and they are packed full of flavor. Great on their own for snacking or as accompaniments to a charcuterie board at your next wine & cheese party. Try it – you’ll never go back to buying those cardboard boxes again. Yields about 40 crackers. This post is part of the monthly link up party Our Growing Edge. This event aims to connect food bloggers and inspire us to try new things. I, for one, am glad to have tried making homemade crackers, and you can bet that I’ve since left that aisle of the grocery store and will never look back. In fact, I’ve already made this recipe twice in the past few weeks! This month is hosted by Marija at Palachinka. Yes, dear readers – the cat is out of the bag. I refer to my mother as Mommie. 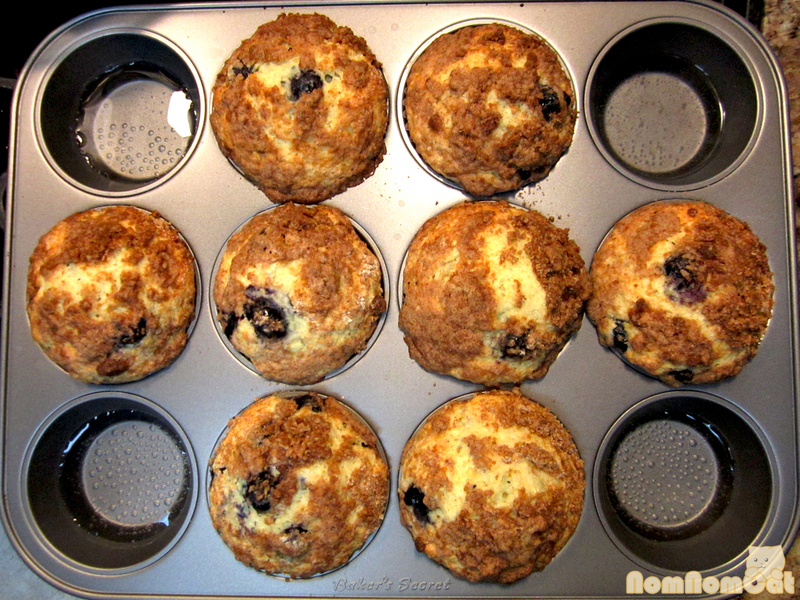 I had contemplated titling this post “Mom’s Blueberry Muffins” to avoid any potential embarrassment, but then I realized that there are a billion and one recipes out there called “Mom’s Blueberry Muffins.” So I figured, why not call it like it is? 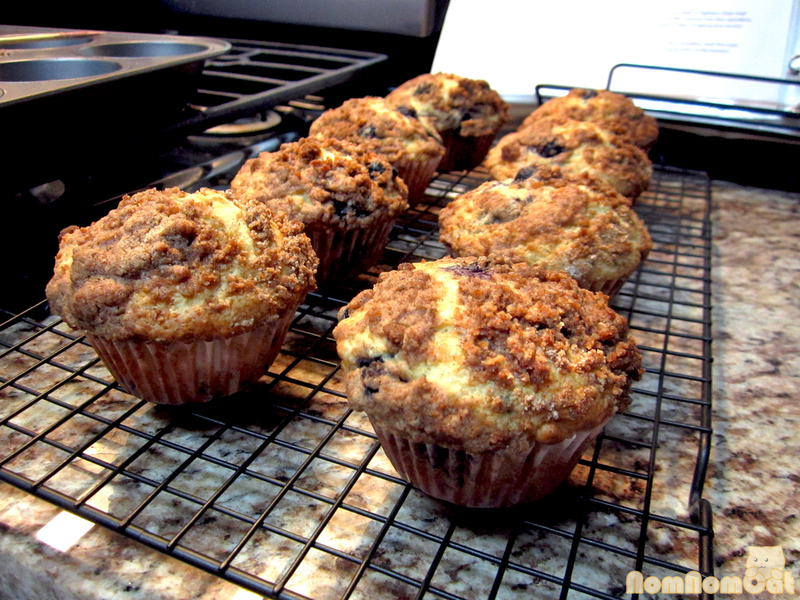 These moist and fluffy muffins are filled to the brim with blueberries, topped with a crispy crumble of streusel, and even better – they contain NO oil. Magical, right? A worthy adversary for Starbucks’ Bountiful Blueberry counterpart. And Starbucks Gold Card carrying Martin gives my muffins his seal of approval, so that’s a vote of confidence right there! We hope you’ll enjoy this sweet intermission from our Boston recap series. adapted from AllRecipes.com. I made a few further adjustments as well. Pro-tip: the water in the “spare” muffin cups helps to keep the oven moist, yielding yummier muffins! Preheat the oven to 400 degrees F. Using a 12-muffin tray, line 8 muffin cups with paper liners and fill the remaining 4 with a bit of tap water (about 1/8 cup each). Set aside. 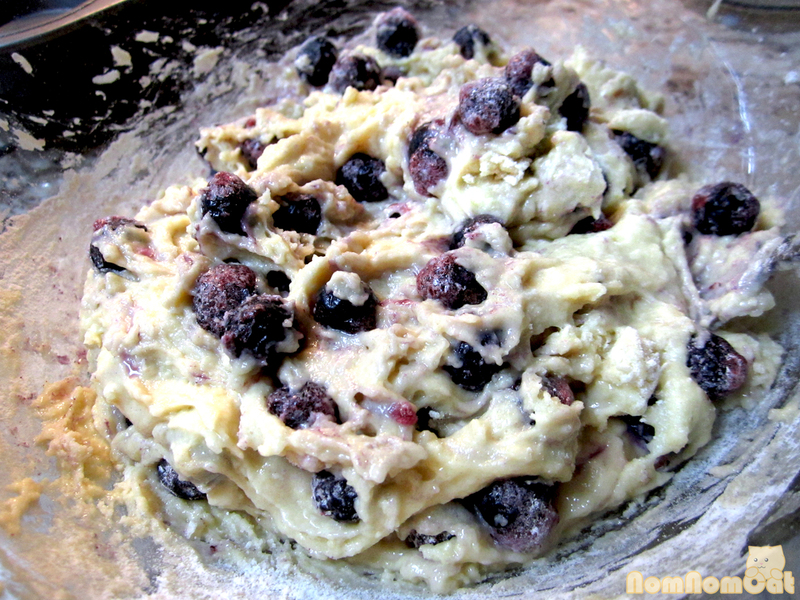 This is the mix-together-dry-ingredients step, but pause – are you using fresh blueberries or frozen? 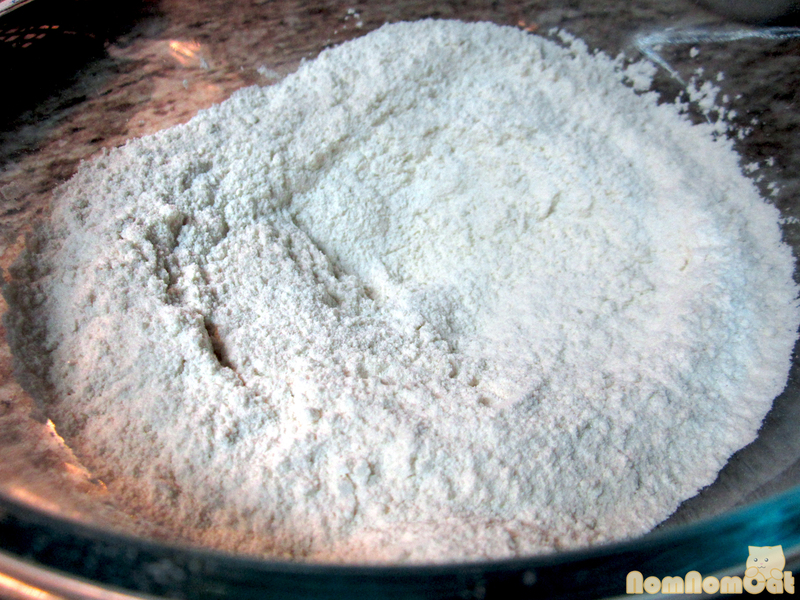 If frozen, reserve about 1-2 tablespoons of the flour in a small bowl. 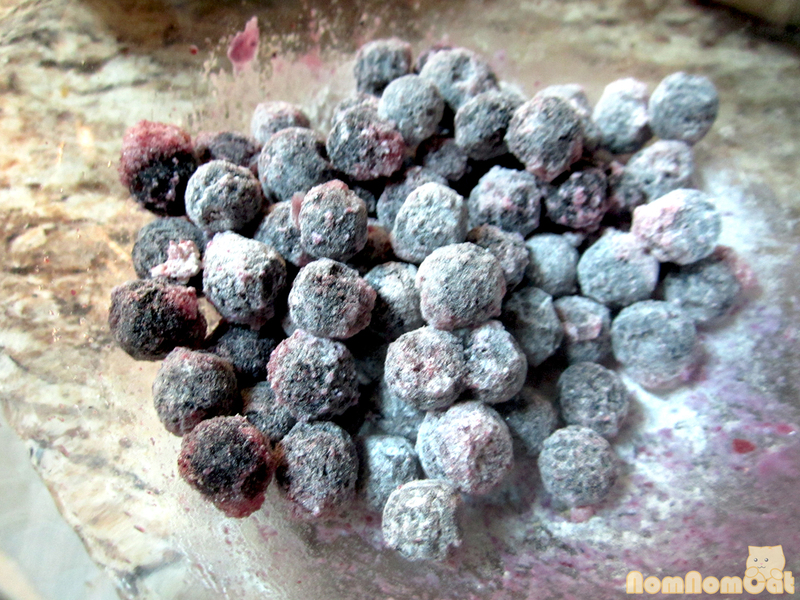 Use this reserved flour to dust the frozen blueberries; this small but important step will help keep the frozen little buggers from bleeding and exploding in your finished product. 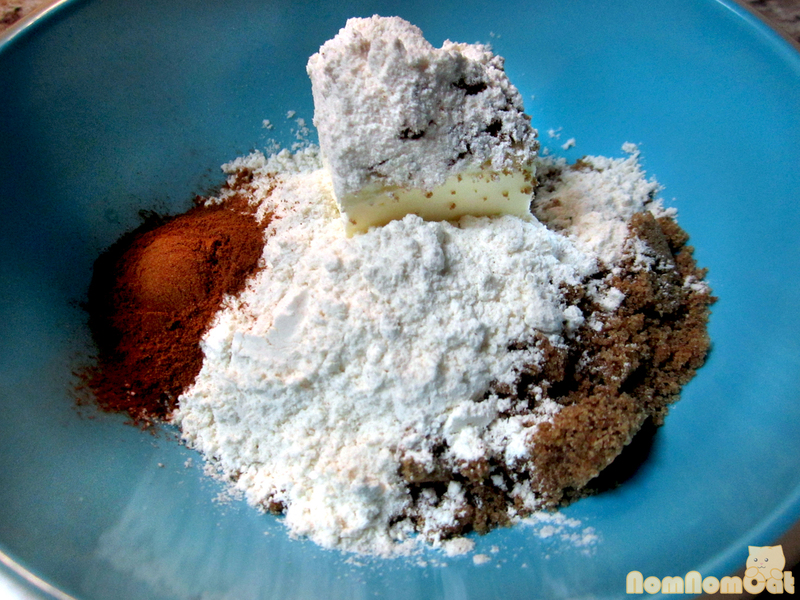 Now combine the (remaining) flour, sugar, salt, and baking powder in a medium-sized bowl. Time for the liquids! 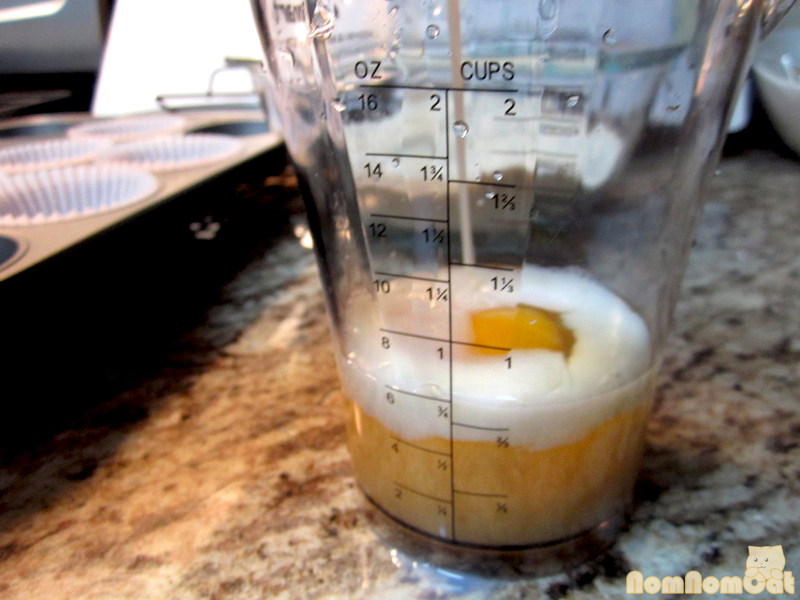 Take out a liquid measuring cup with capacity for at least 1 cup of fluid. Add the applesauce (or oil), egg, and enough milk to fill the cup to the 1 cup line, approximately 1/3 cup depending on the size of the egg. Beat well. Take this opportunity to prepare the crumb topping. The wet and the dry ingredients can hang out separately but once you mix them, you’ll want to get the muffins into the oven as quickly as possible. Anyway, place the stick of butter in a small bowl and measure out the sugar, flour, and cinnamon. 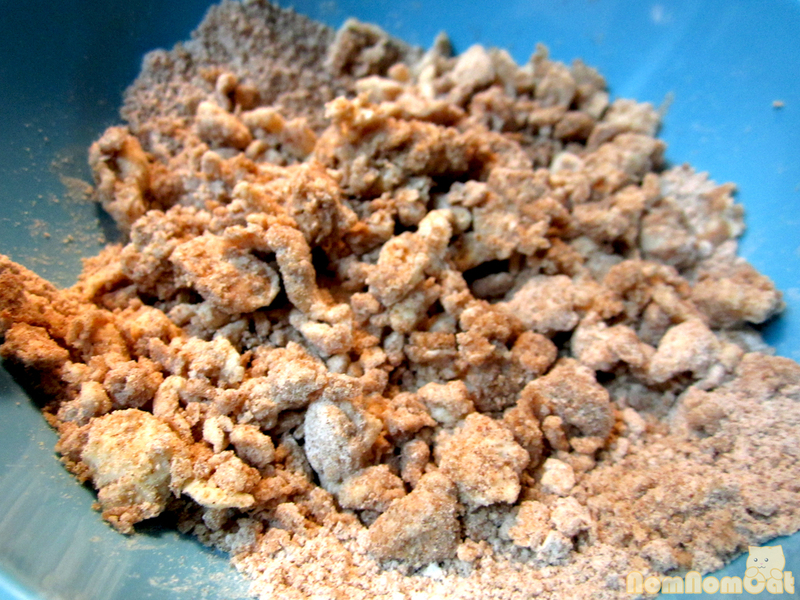 Using a fork, break up the butter and work the streusel mixture until you end up with crumbs no larger than pea-sized. Now for the moment of truth. 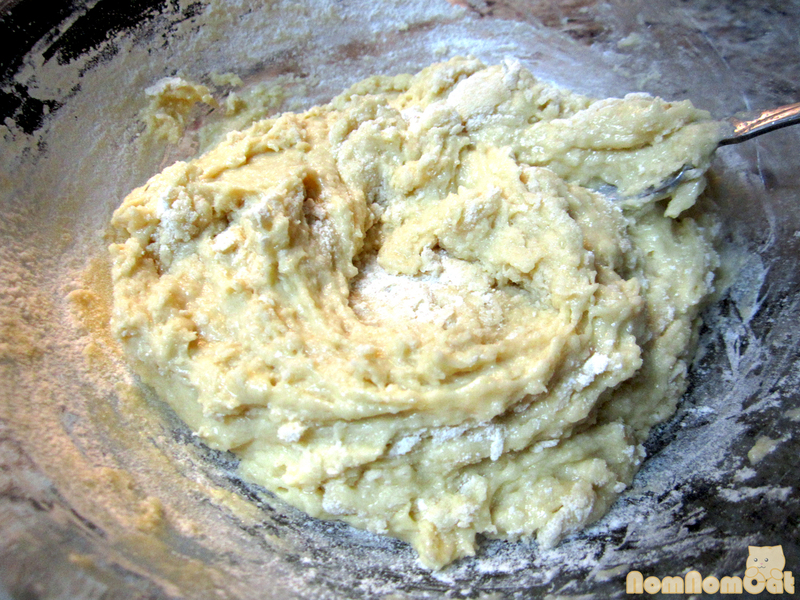 When combining the liquids with the dry ingredients, you will want to work quickly to avoid over-beating the batter. 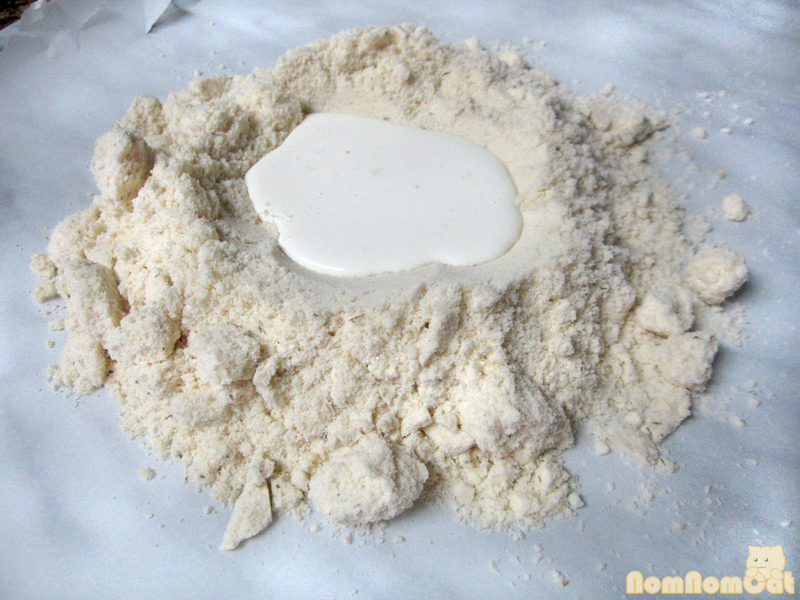 Pour the liquid mixture into a “well” in the center of the dry ingredients. Stir just enough to moisten and combine. 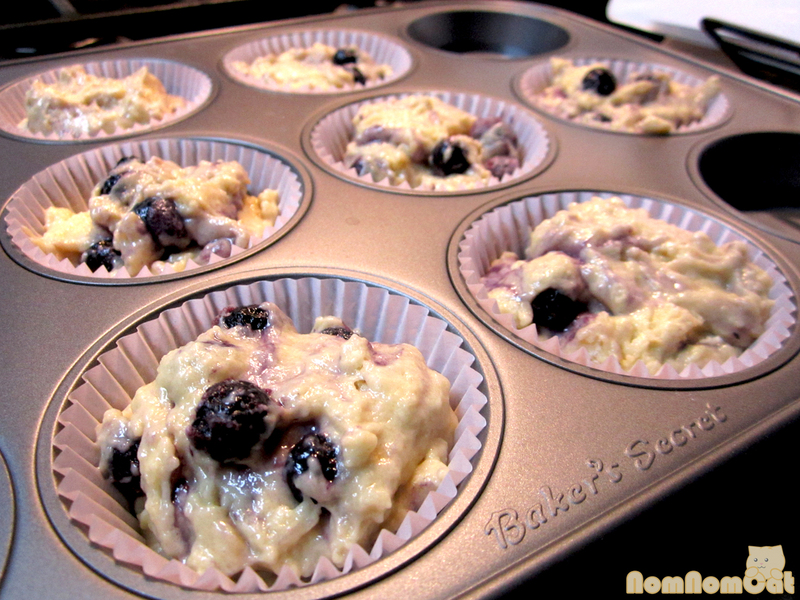 As the streaks of flour start to disappear, fold in blueberries. Now stop mixing! Fill prepared muffin cups to the top. 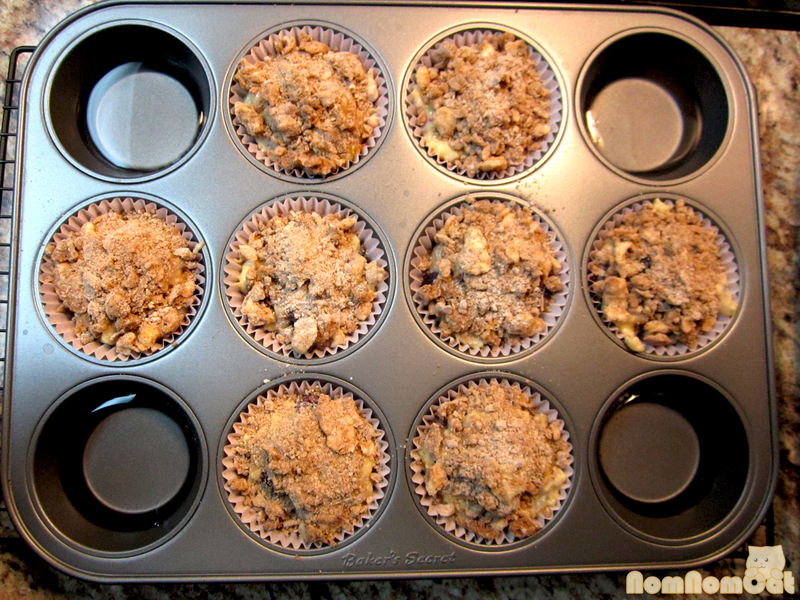 Generously sprinkle the streusel crumb topping over muffins before baking. 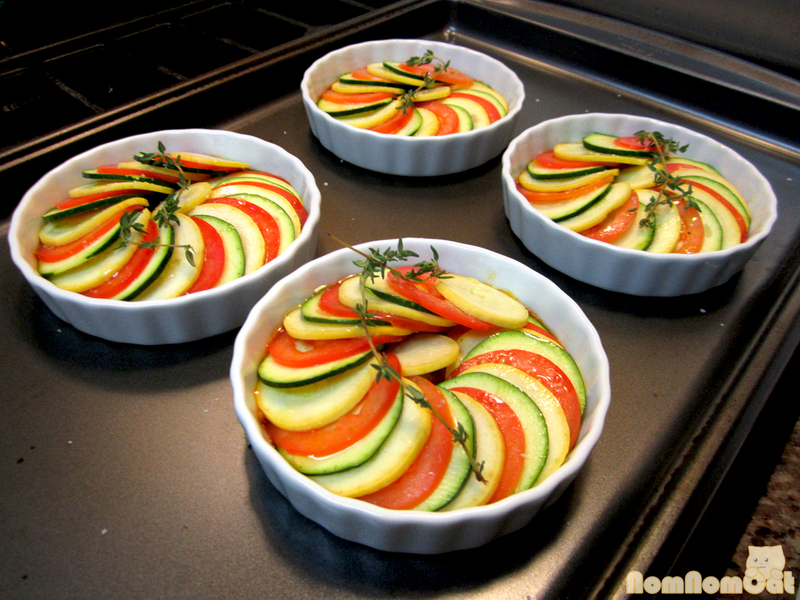 Bake for 20-22 minutes in the preheated oven. 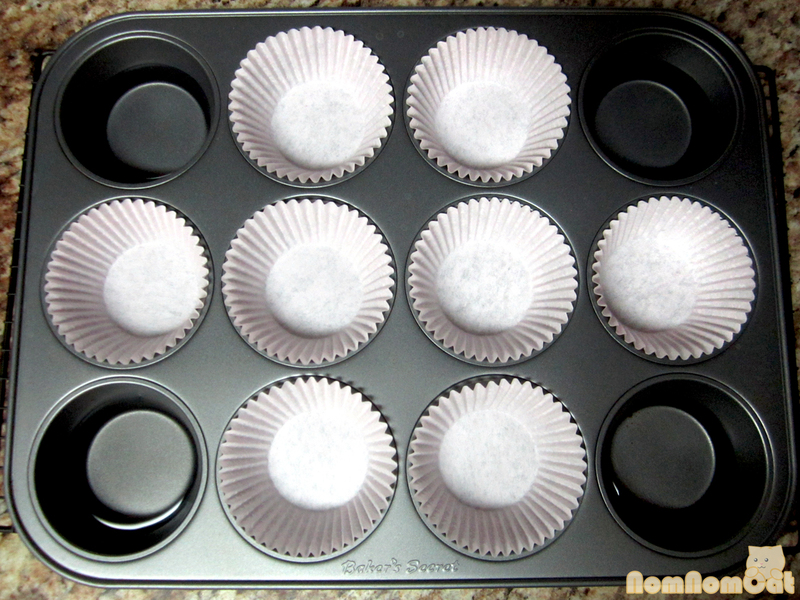 Transfer the finished muffins to a cooling rack and store in an airtight container. These will keep for about 3-5 days out on the counter (if they last that long!) but they can also be wrapped individually and kept in the freezer for a quick rainy day snack or breakfast. Simply microwave for 1 minute or so for that fresh-baked feeling! 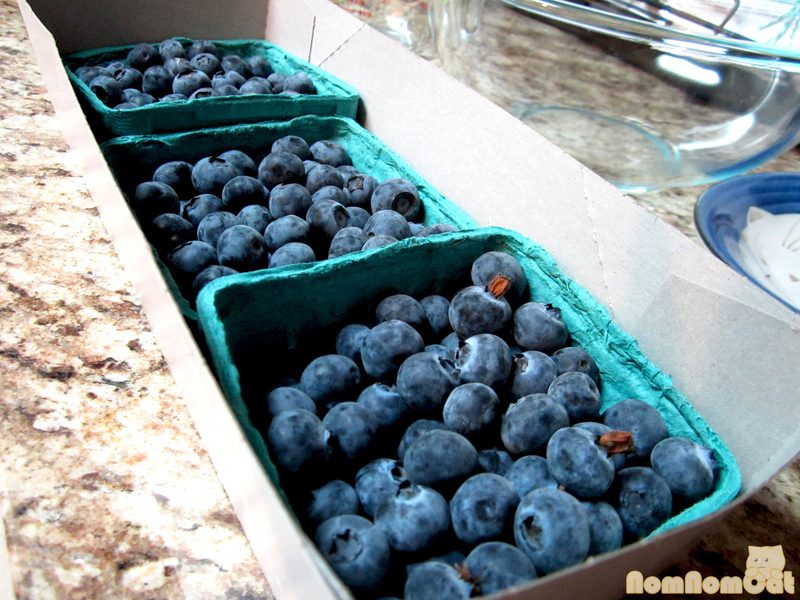 We just entered blueberry season and found these lovelies at our local farmer’s market. They make wonderful muffins as well, but I prefer to save them for non-baking applications that would benefit more from their freshness. That said, the muffins I whipped up with these were pretty darn tasty! I think one of my all-time favorite kitchen substitutions has to be applesauce for oil in baking. Someone once told me, “Everything in moderation!” – so by using applesauce and skim milk for the muffin batter (leaving only the egg yolk to provide fat among 8 muffins), and then topping it with the decadent butter-laden streusel, I’d say we have a well-balanced breakfast… maybe. Humor me*. *Disclaimer: I often write jokes that are probably funny only to me. Also, I am not a registered dietician. 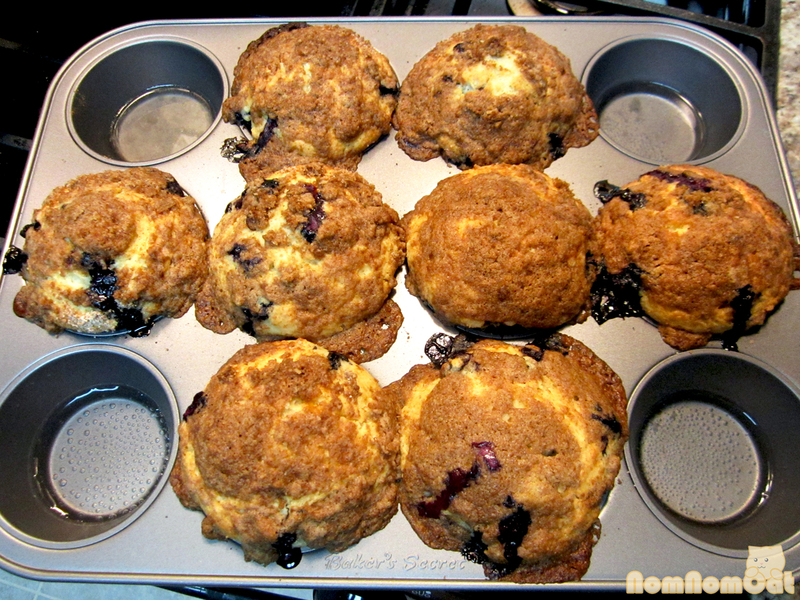 Please do not take this recipe and go rouge with some sort of Morning Blueberry Muffin Diet. Yup – I totally had that conversation last week. But layered with cheese, simmered in milk, and beautifully browned with a crunchy crust, the classic potato gratin really does bear resemblance to a baked macaroni and cheese dish. The fork-tender slices of potato glued by savory Gruyère and a golden crust worth fighting over both make this dish a winner! Preheat the oven to 350 degrees. Wash and peel the potatoes. 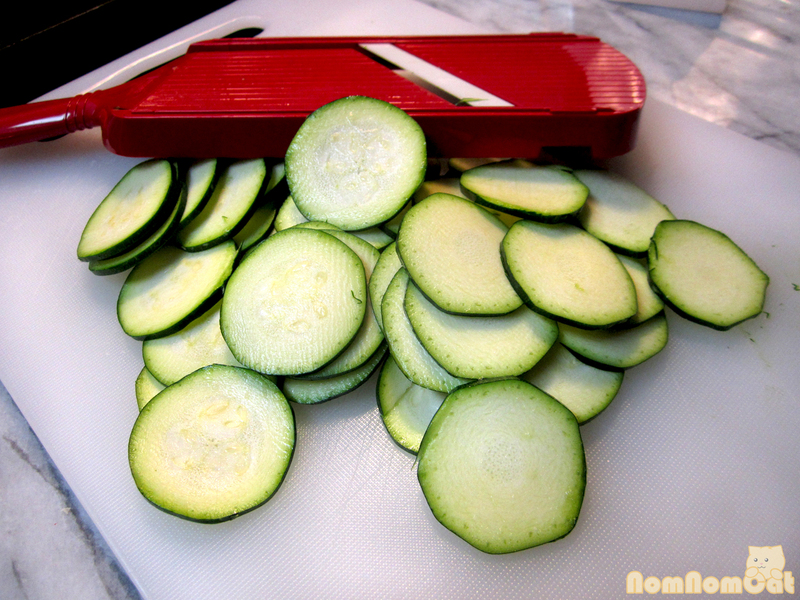 Being very careful with a knife (or using a mandoline if you have one), slice into rounds anywhere from paper-thin to no thicker than about 1/8th inch thick. Just be as consistent as you can, for even cooking. Grate the cheese into a bowl and set aside. 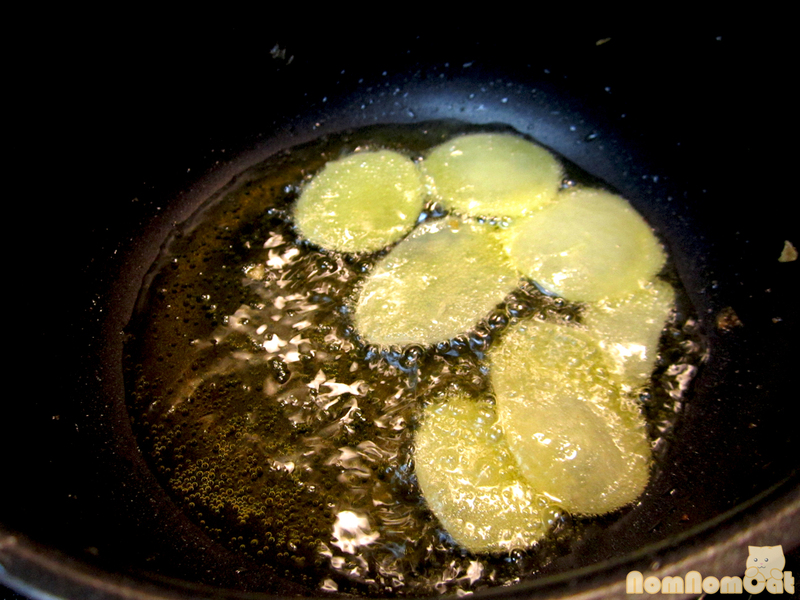 In a small pan, heat the butter until it just starts to bubble and brown. Add in the onions and season with salt and pepper. 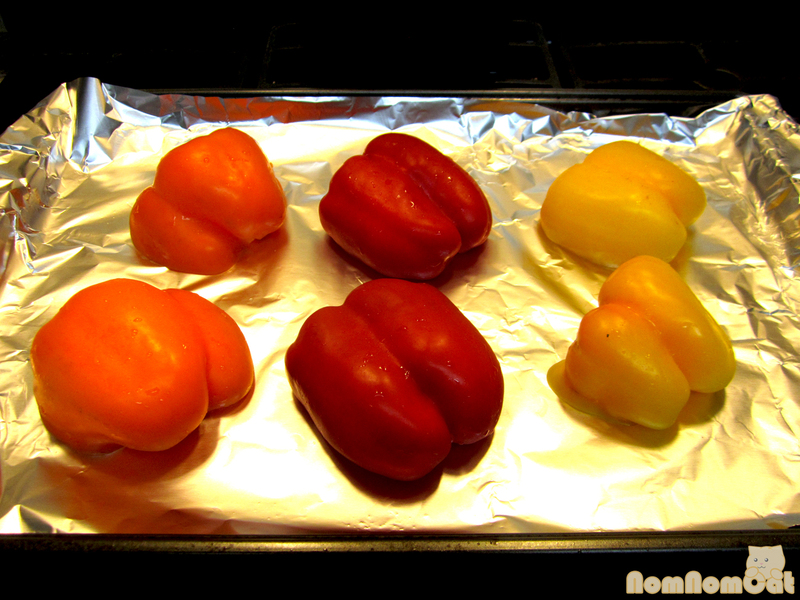 Saute until translucent and sweet – about 5 minutes. Once they’re done, set aside to cool off. 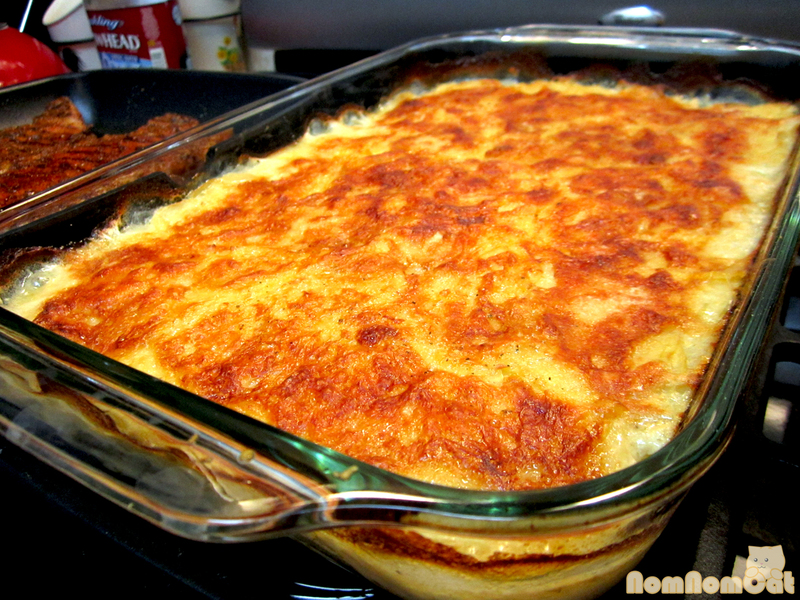 Butter a 9 x 13 pan (or a 9 x 12 gratin dish) generously on the bottom and be sure to work up the sides as well. 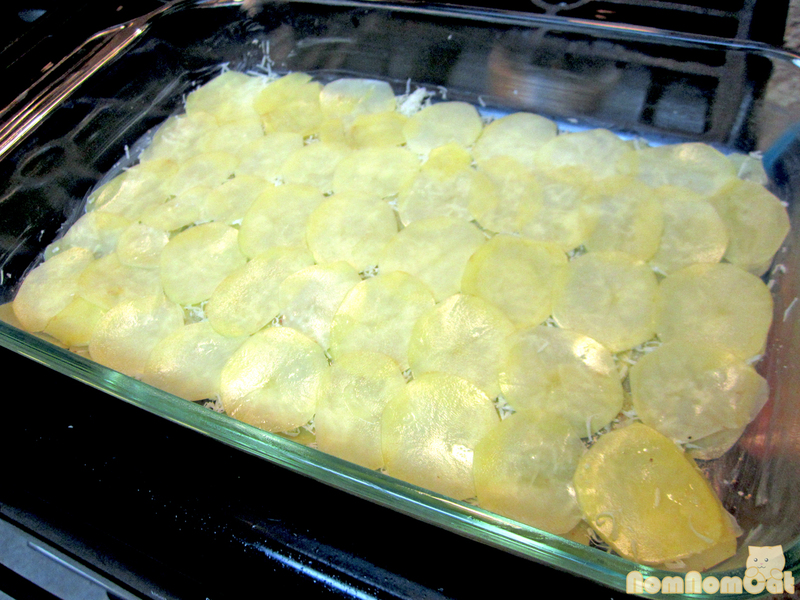 Arrange potato slices in a single layer, allowing the slices to overlap a bit. Season with fresh cracked black pepper and sprinkle lightly with cheese. 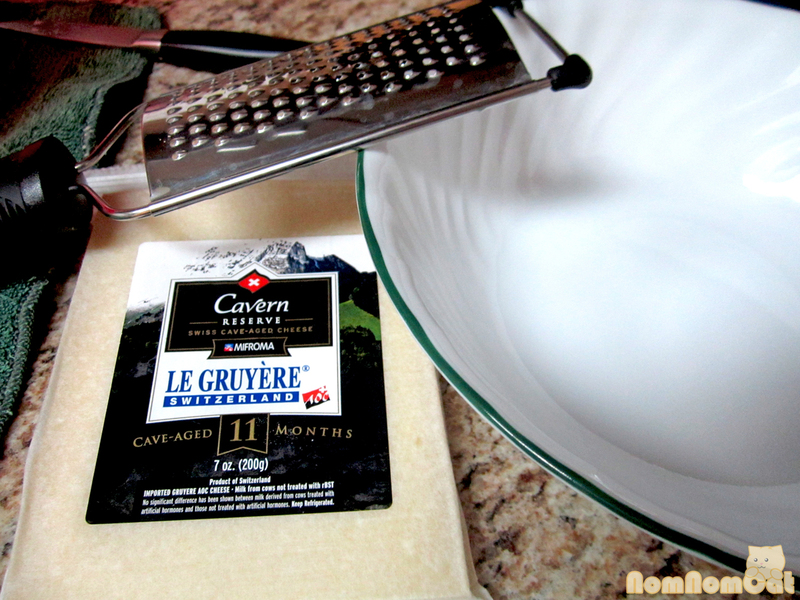 The gruyere I buy comes salted so I go easy on the added salt. Be sure to reserve about 1/3 of the cheese for the very top crust layer. 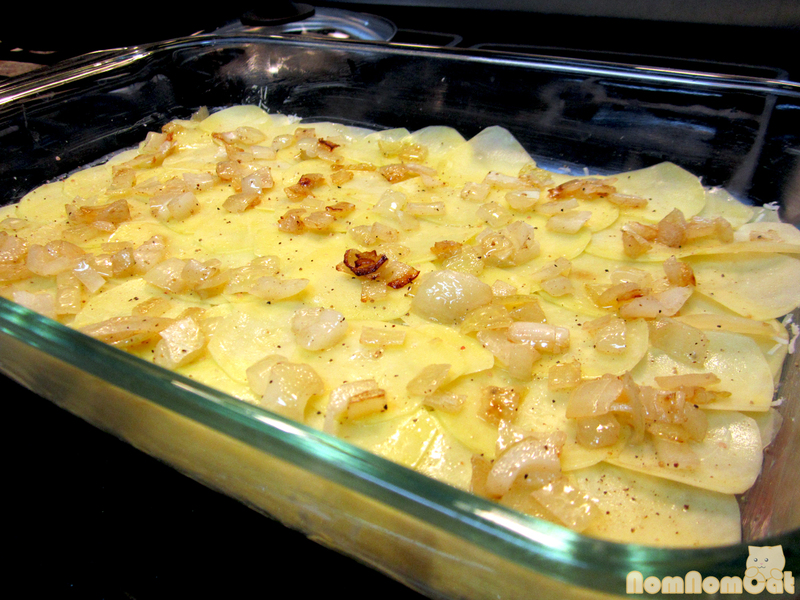 Continue layering with potato, black pepper, and cheese. After about 3 or 4 layers, arrange the next potato layer. 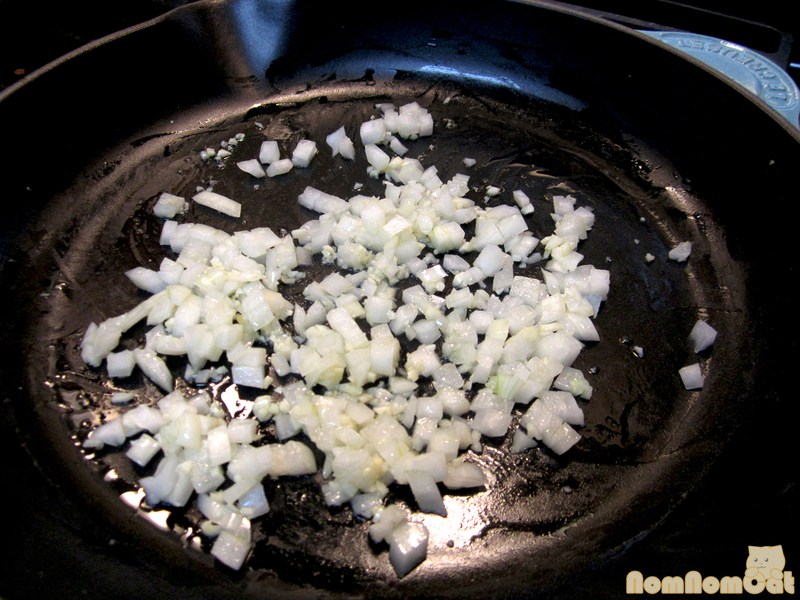 Top with the sauteed onion, spreading to evenly distribute as best you can. Continue with another potato layer and repeat as before. Use up all of your potato slices or as many as it takes to make about 8-10 layers, leaving one last layer of just potato. 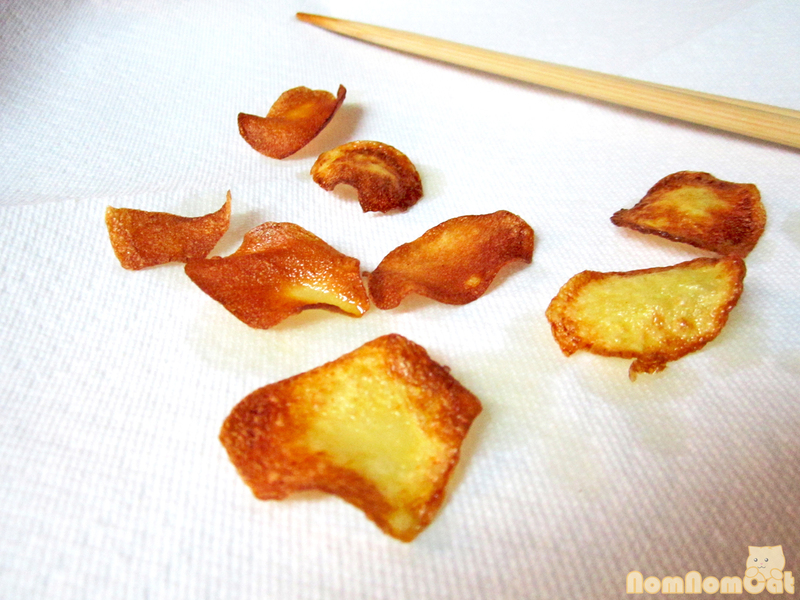 Fret not if you have extra lonely slices – you can reserve these leftover slices for making potato chips! 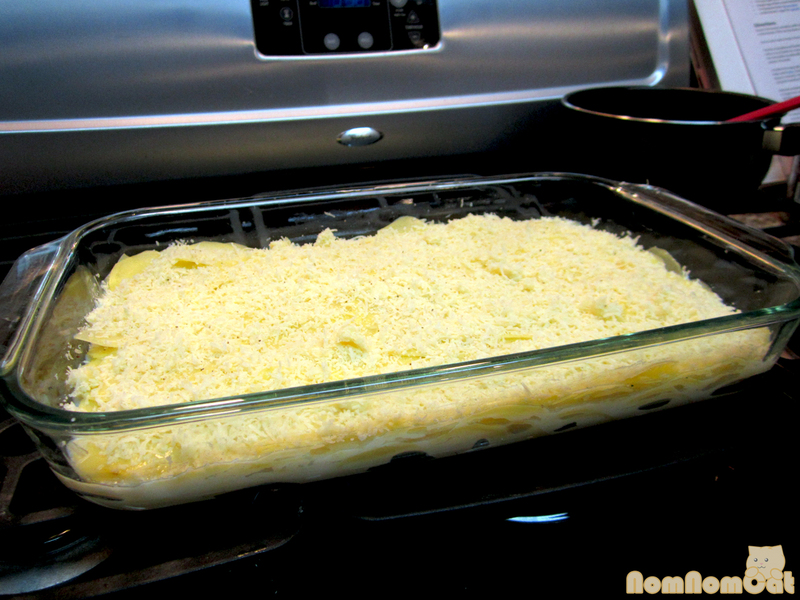 Pour the milk over the prepared gratin, letting it seep between the layers. Finally, top with the reserved 1/3 of cheese and bake for about 45 minutes to one hour, or until everything gets bubbly and the crust becomes a gorgeous golden brown. Slice into squares and serve hot. We generally cut the 9 x 13 pan into sixths but it can easily serve 8 if part of a larger meal. 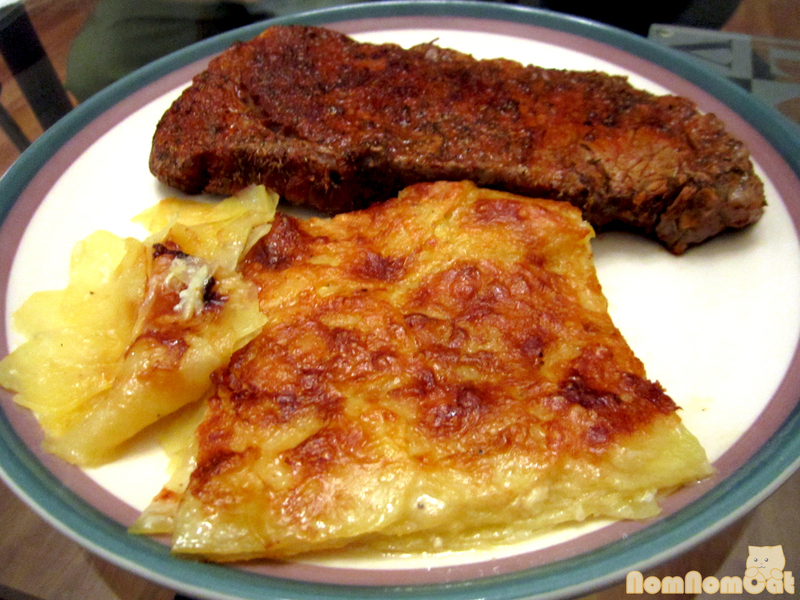 Some nights we’ll eat the gratin on its own paired with a freshly tossed salad… and other nights, we’ll start sizzling up some steaks when the gratin is about 15 minutes out from being done. 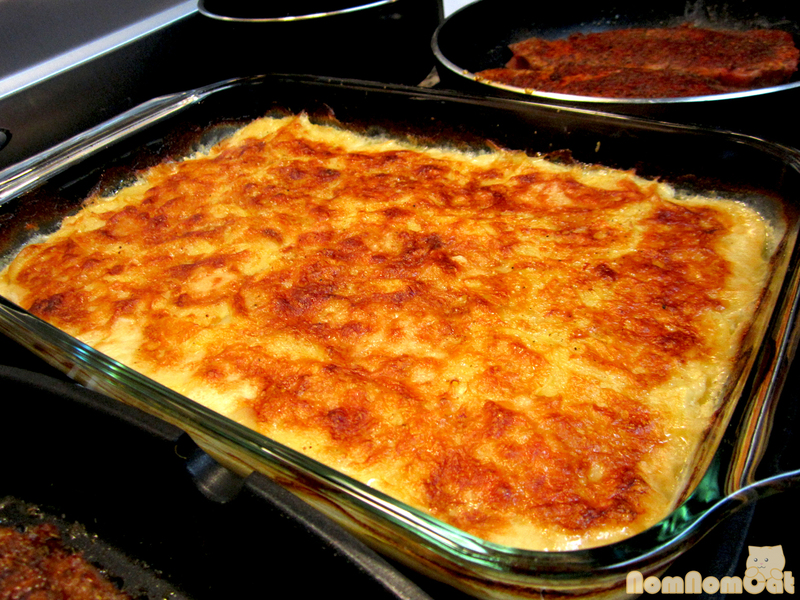 As a side or as a (relatively) light main, this potato gratin is comforting and hearty dish that’s sure to please! 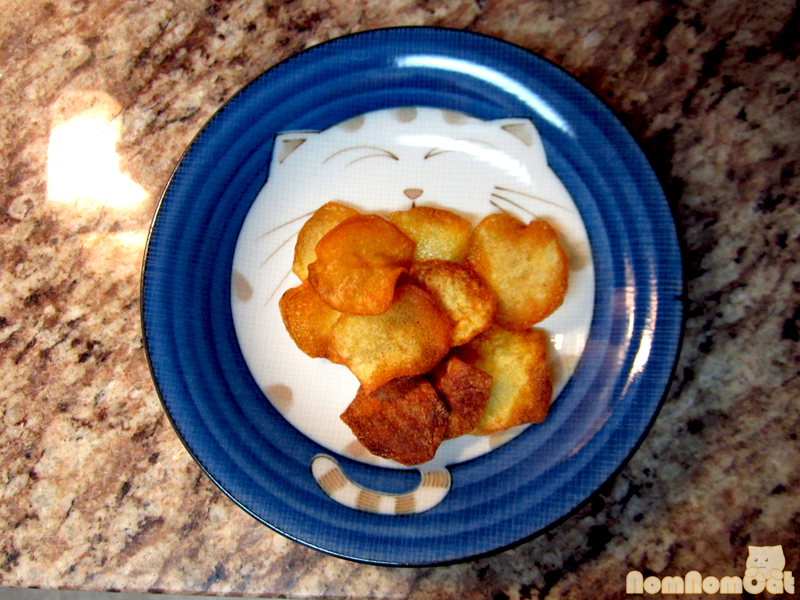 Bonus Recipe: Homemade Potato Chips! Pour enough oil into a pan (or the small pot you used to saute onions if you want to save on dish-washing) to come up about 1/2 inch. Heat until a small drop of water dripped into the oil fizzles away (if it splatters, and be careful if it does, turn down the heat and let the oil cool a bit). Drop in a few slices, making sure to not crowd the pan. I like my chips nice and browned – this will take a few minutes. Watch them carefully though! They can go from toasty to burnt in the blink of an eye. Transfer toasty chips to a paper towel lined plate to drain. Sprinkle on a bit of salt (or seasonings of choice!) right when you take the chips out of the oil so they will adhere better.